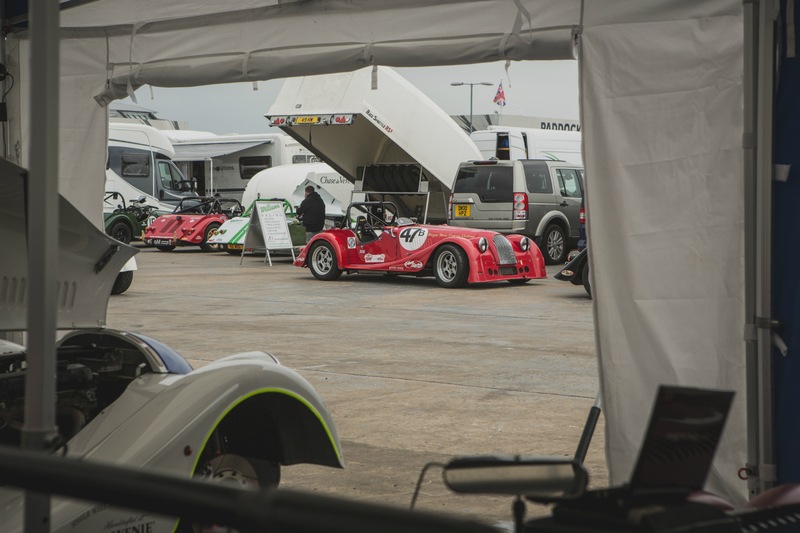 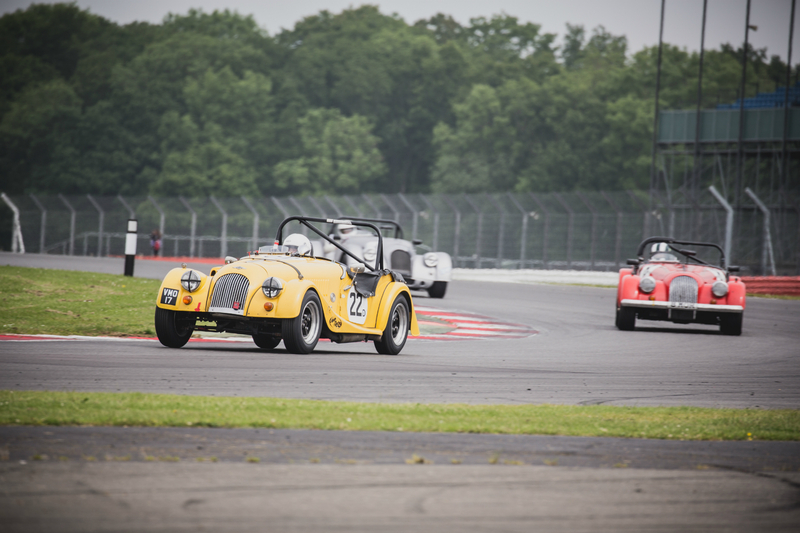 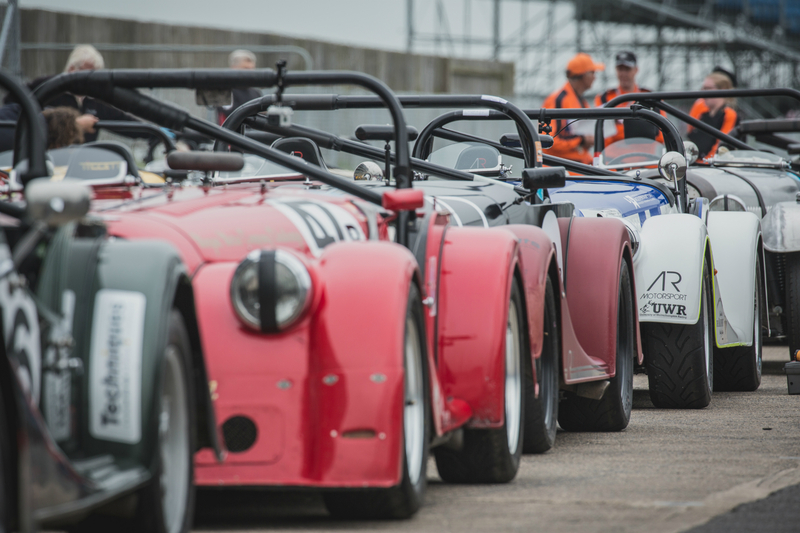 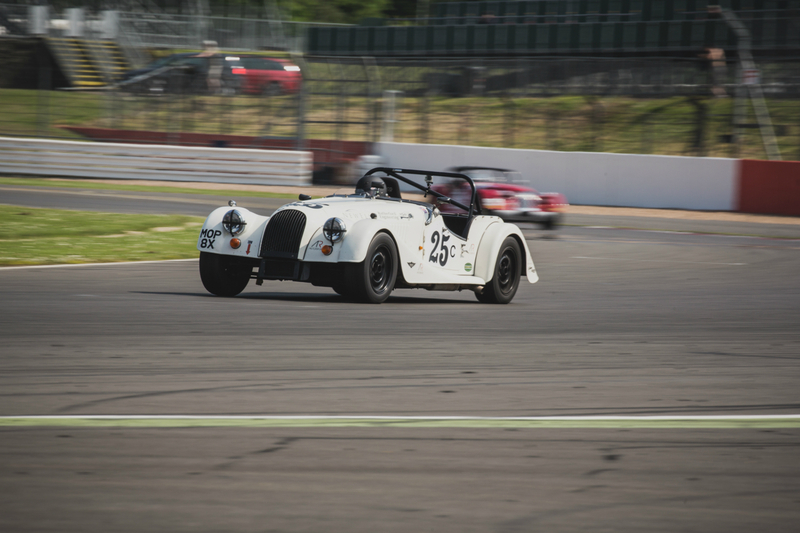 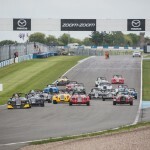 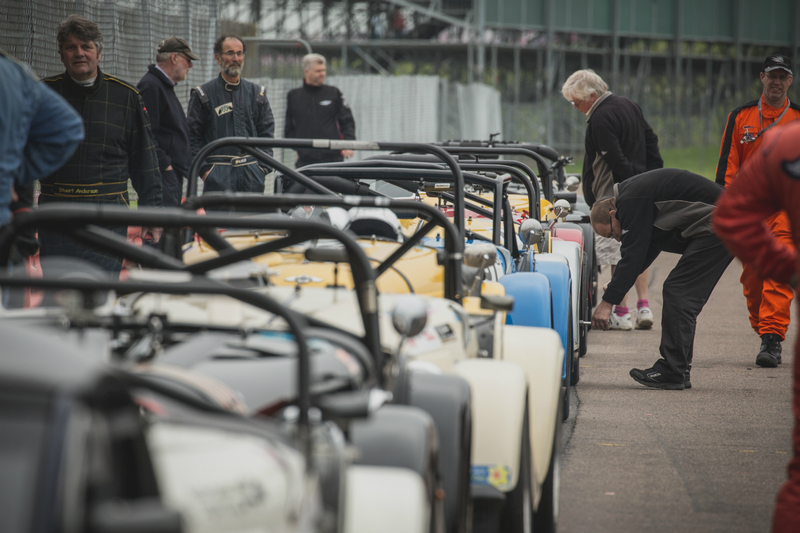 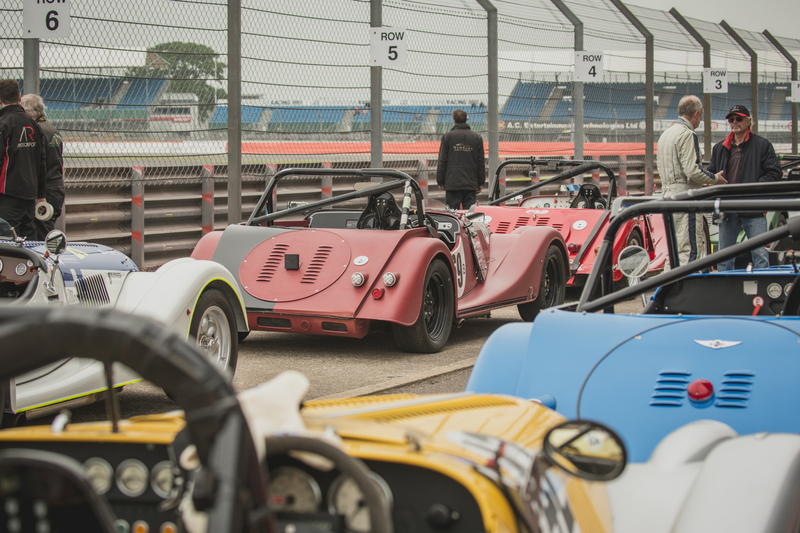 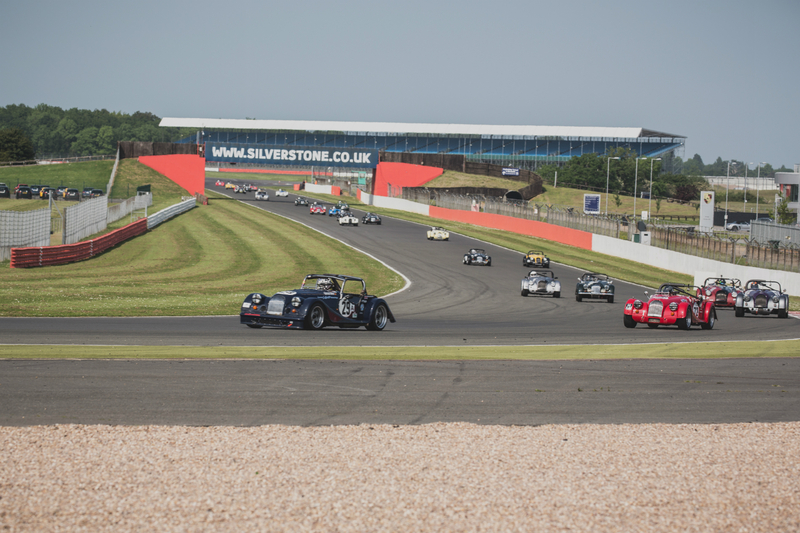 A 29 car grid headed to Silverstone last Sunday (5/6/16) as part of the MGLive! 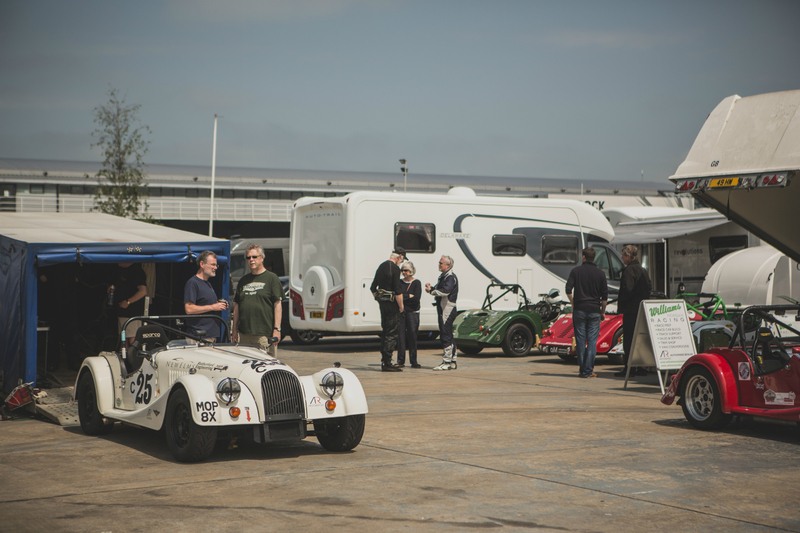 event run by the MG Car Club. 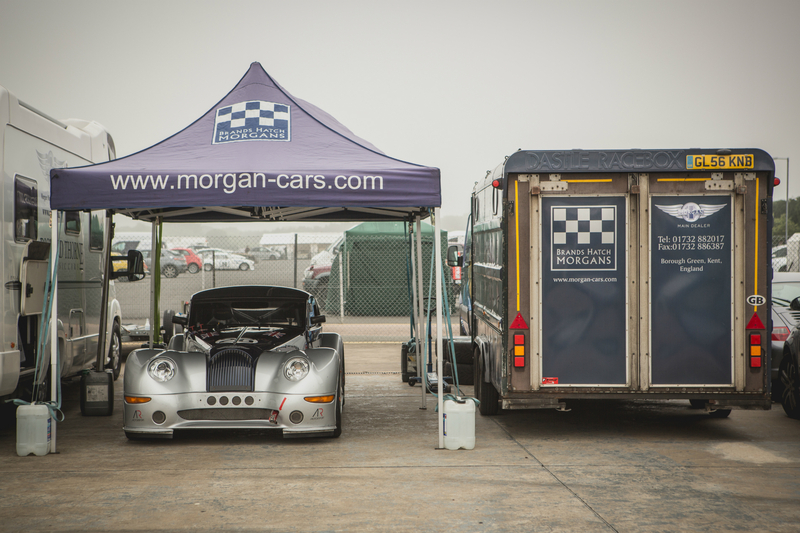 Fog loomed over the circuit for much of the morning, lifting only as the cars took to the track for qualifying at around 11.30. 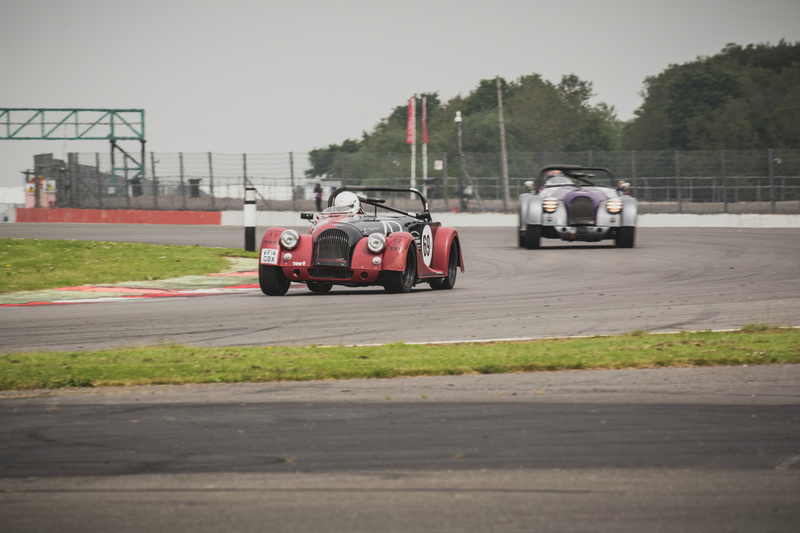 Unlike the VSCC meeting a few weeks previous, the cars were on the Historic GP track, a much longer and more challenging circuit that was set to produce some great racing. 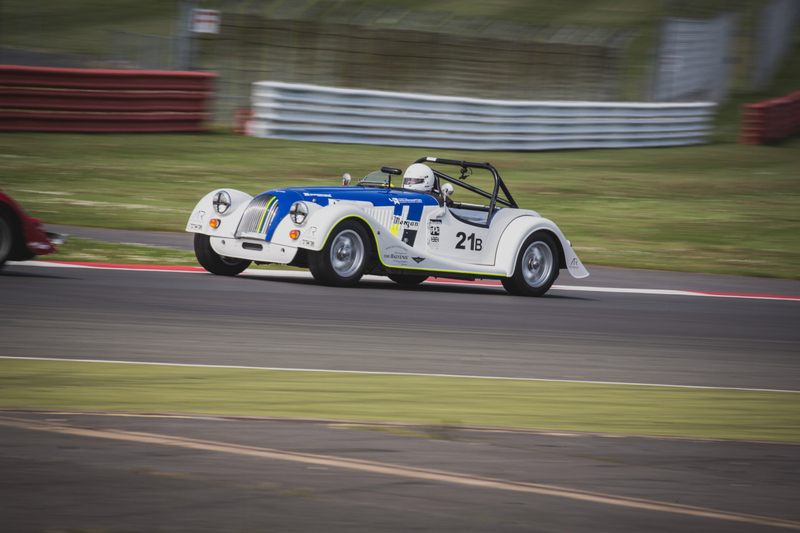 Normal service was resumed for qualifying as Keith Ahlers put his Plus 8 at the front of the grid, some 6 seconds ahead of next place Class A car Russell Paterson. 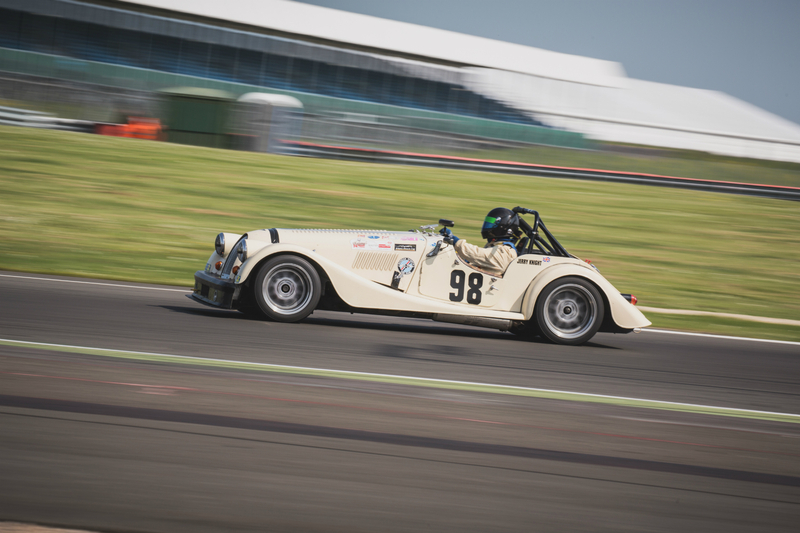 Elliot Paterson qualified 1st in Class B, just over a second in front of Tony Hirst who was back in the factory ARV6 after missing Donington 2 weeks previously. 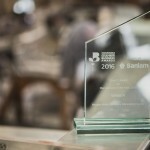 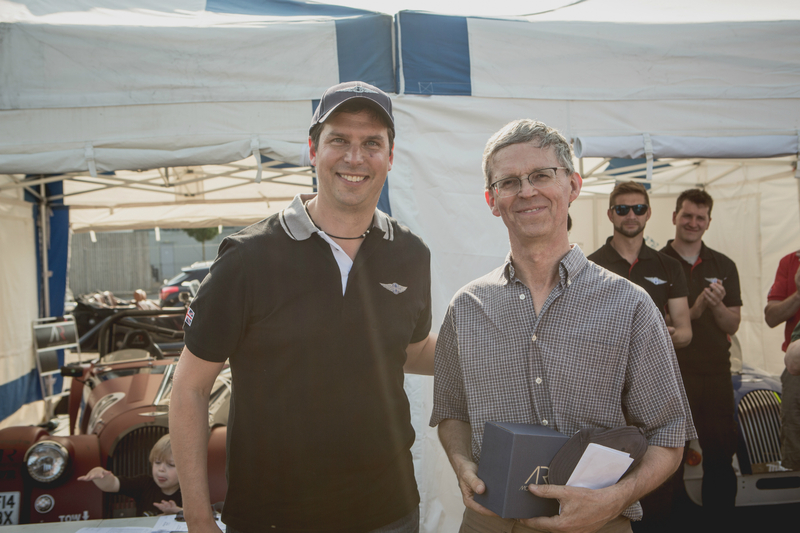 Jerry Knight and Andrew Thompson completed 3rd place in Classes A and B respectively. 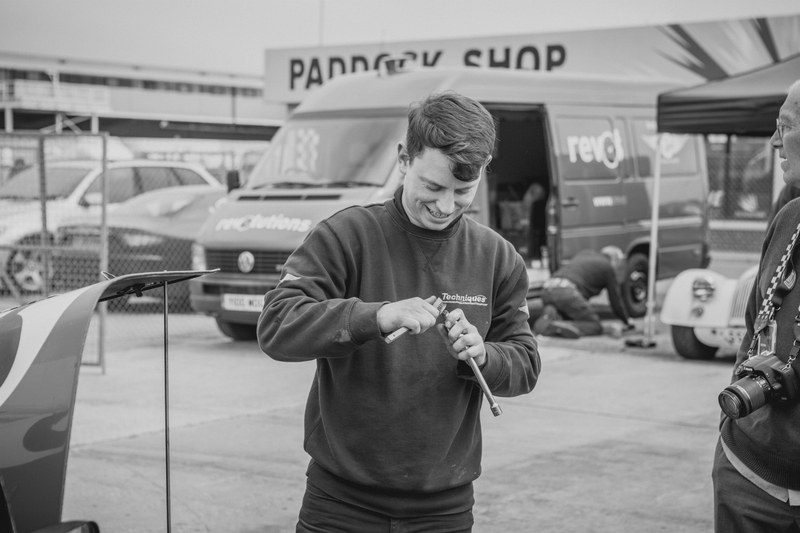 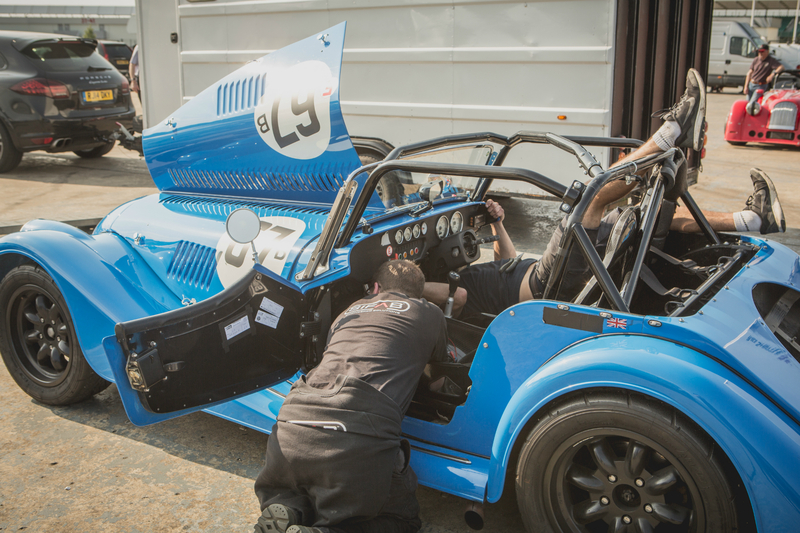 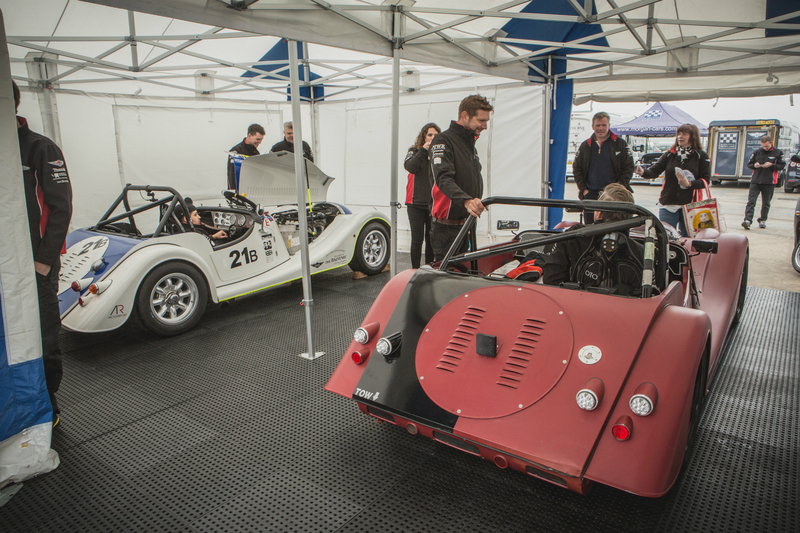 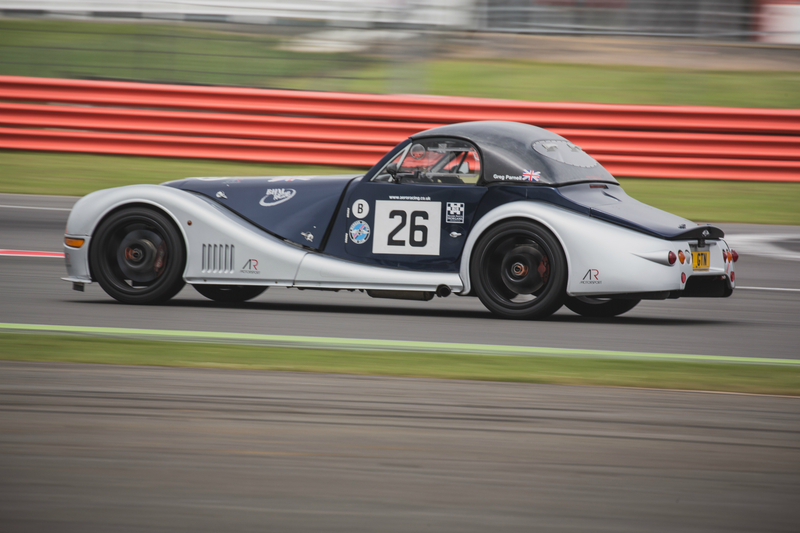 Impressive qualifying sessions from Tim Ayres, Henry Williams and Simon Scott saw them sit in 11th, 12th and 13th place, each of them starting 1st in Class C, D and R respectively. 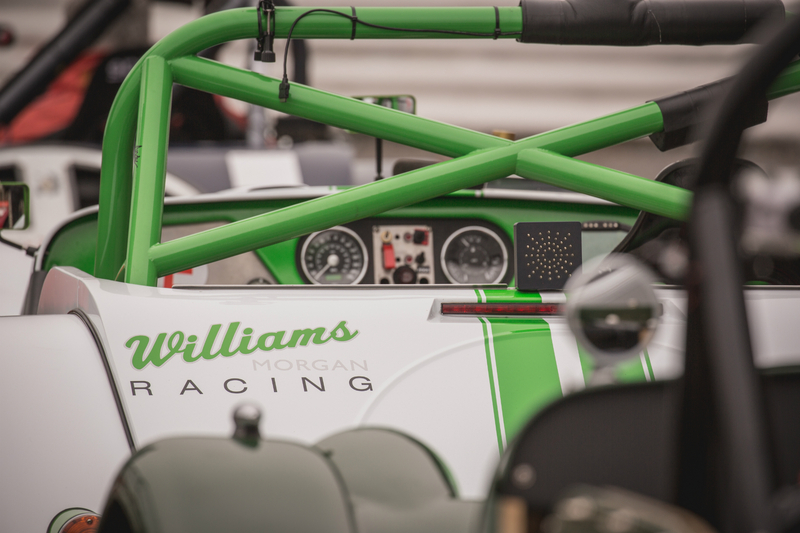 Henry Williams suffered an unfortunate engine failure towards the end of qualifying, meaning he would take no more part in the day. 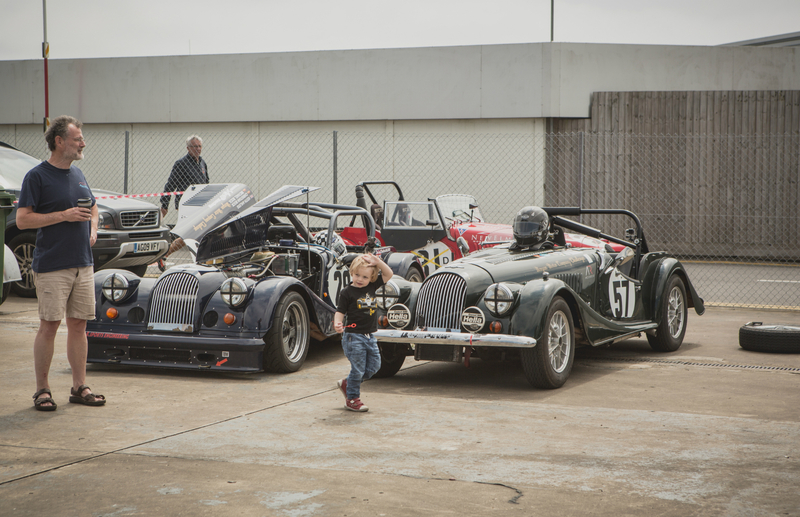 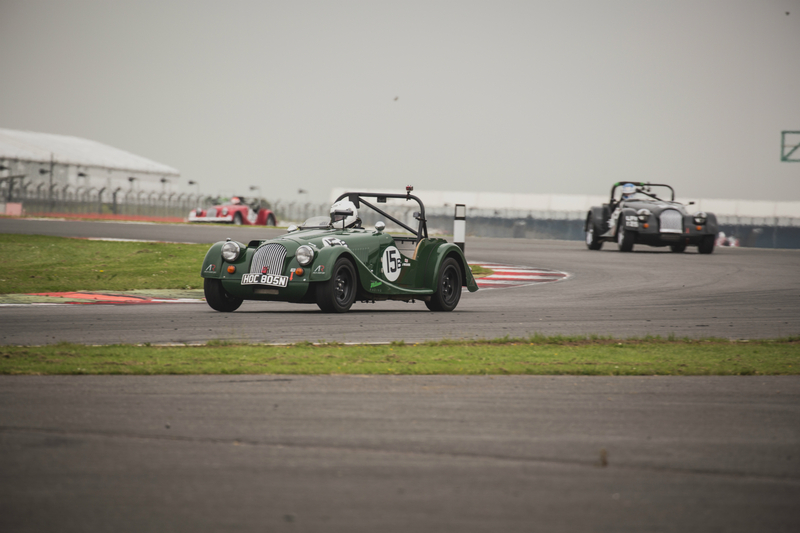 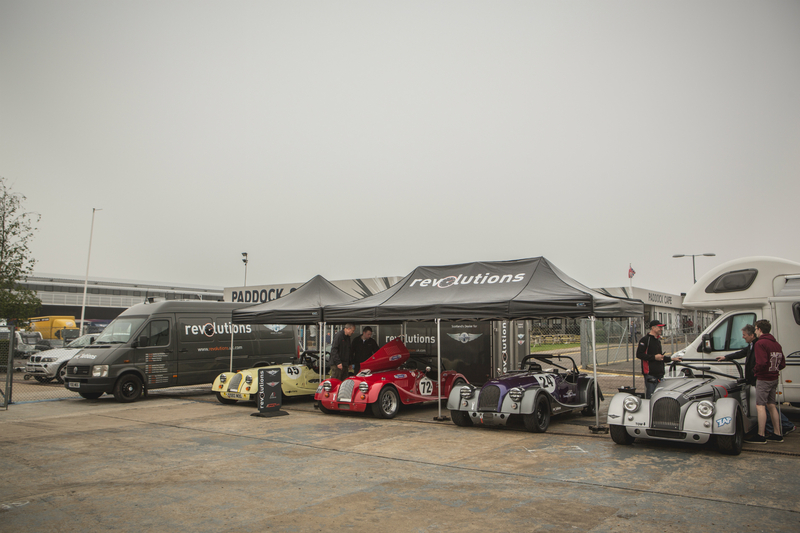 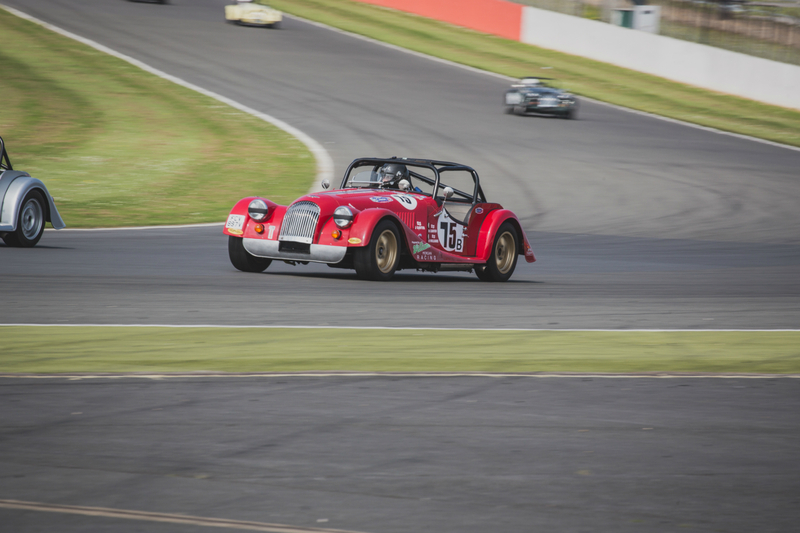 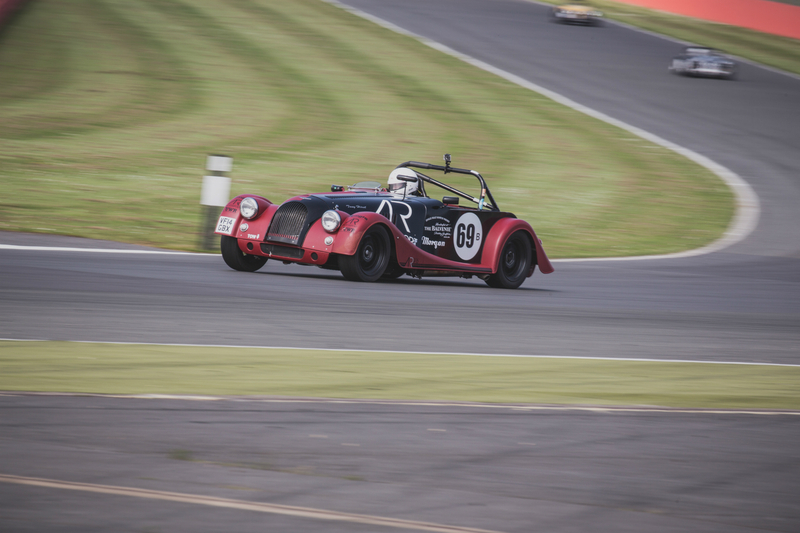 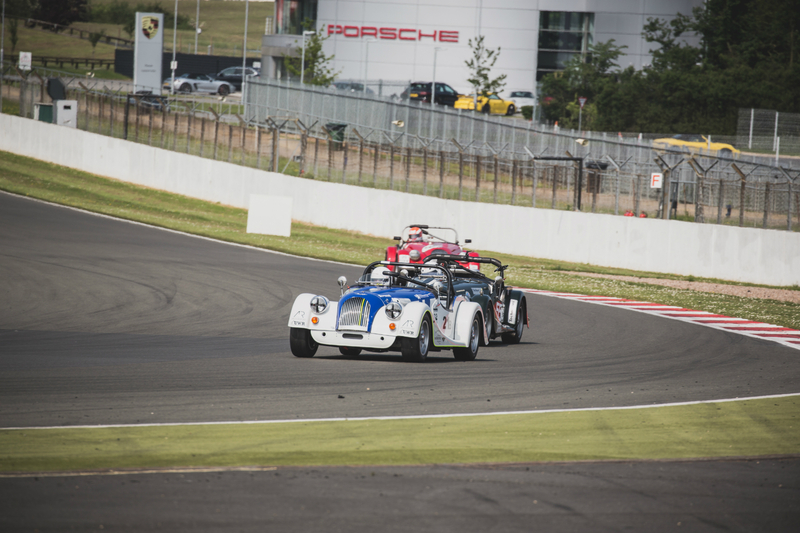 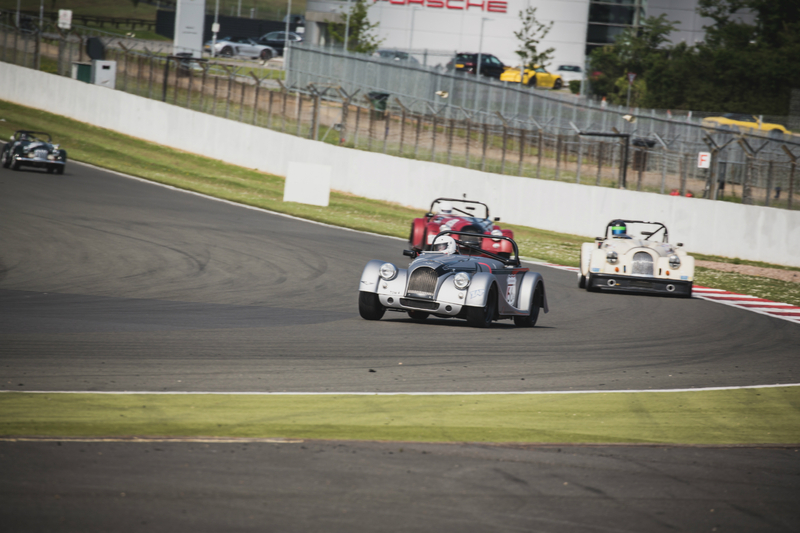 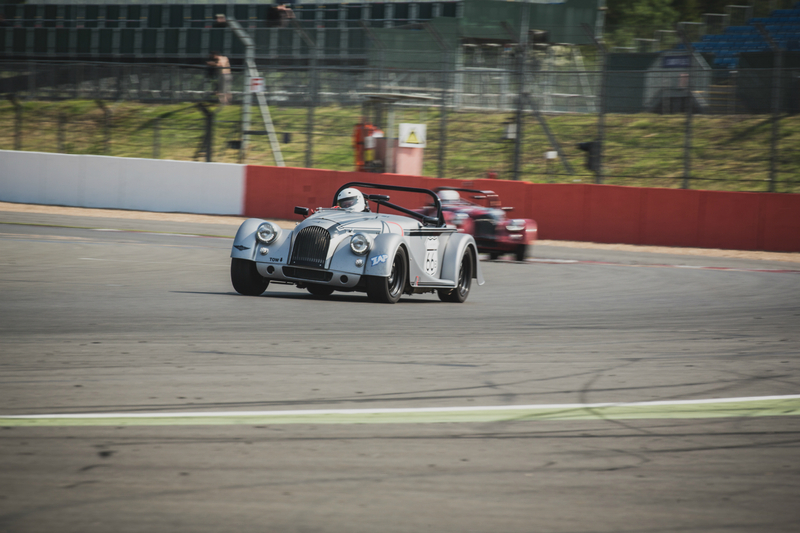 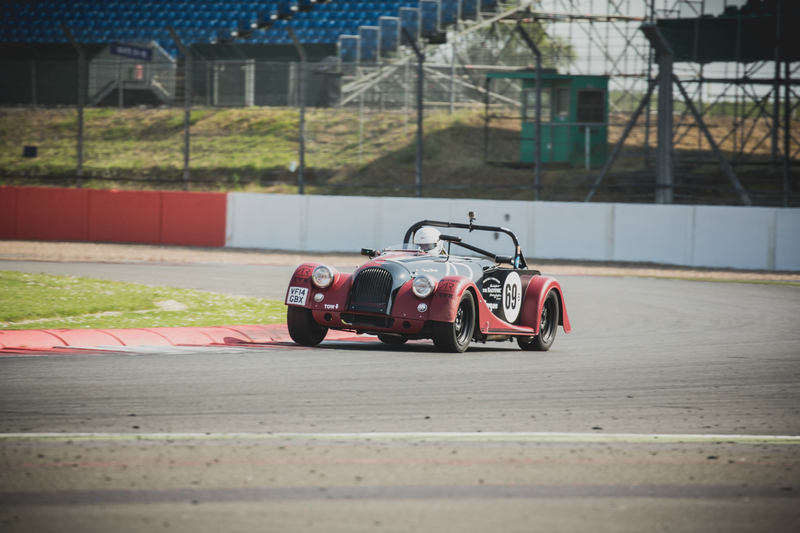 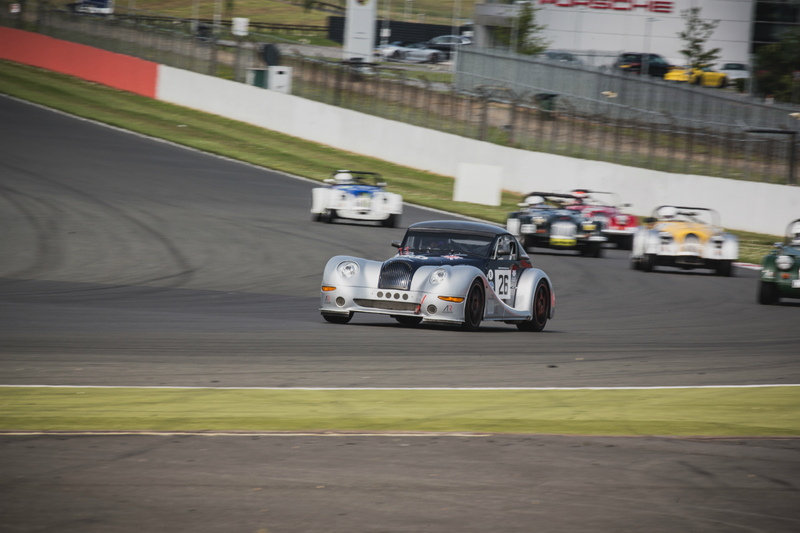 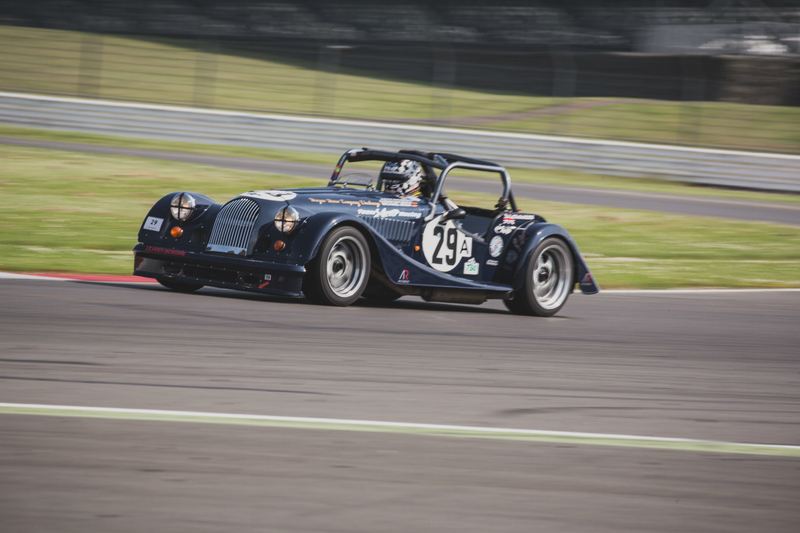 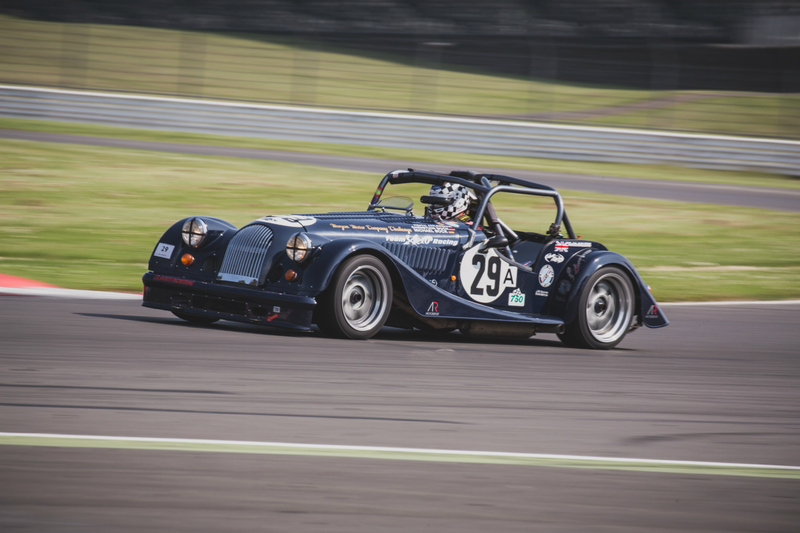 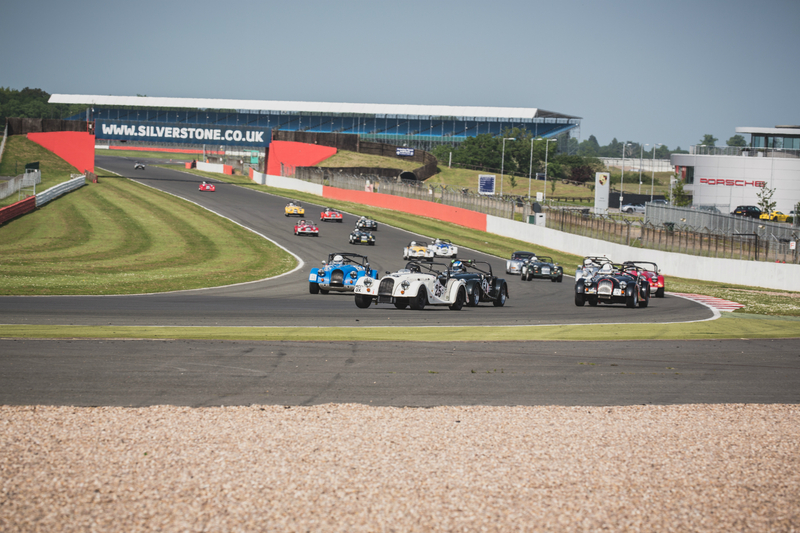 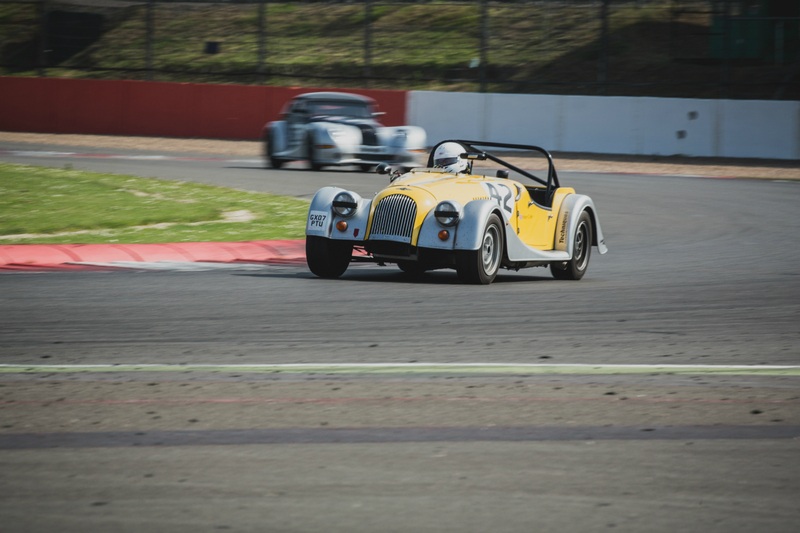 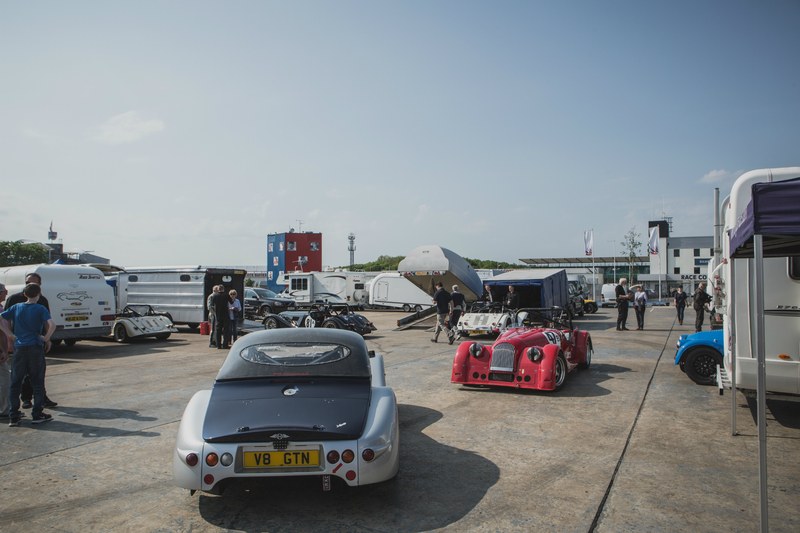 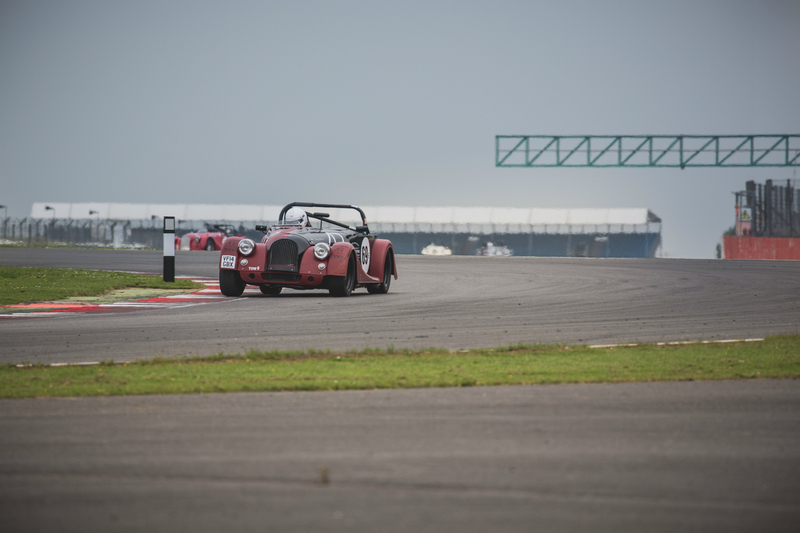 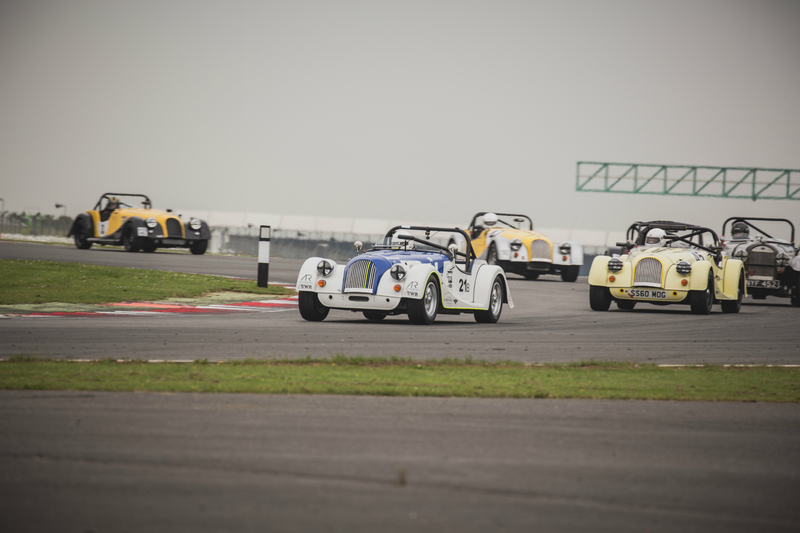 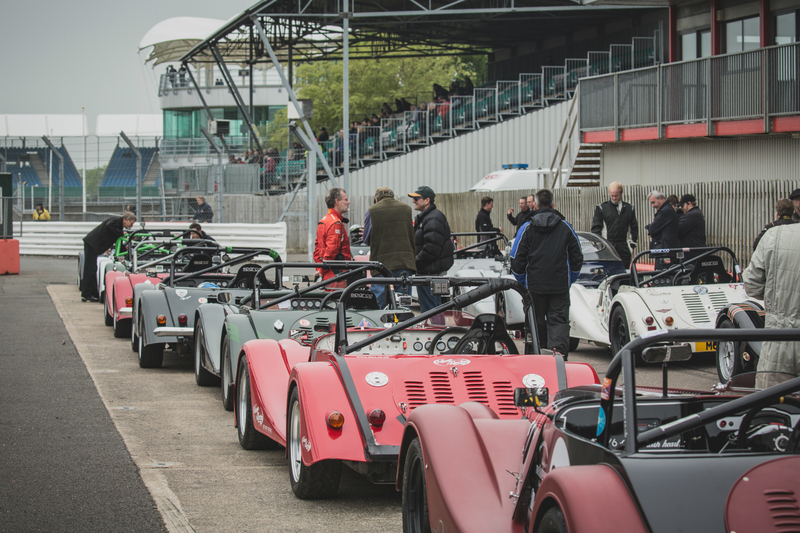 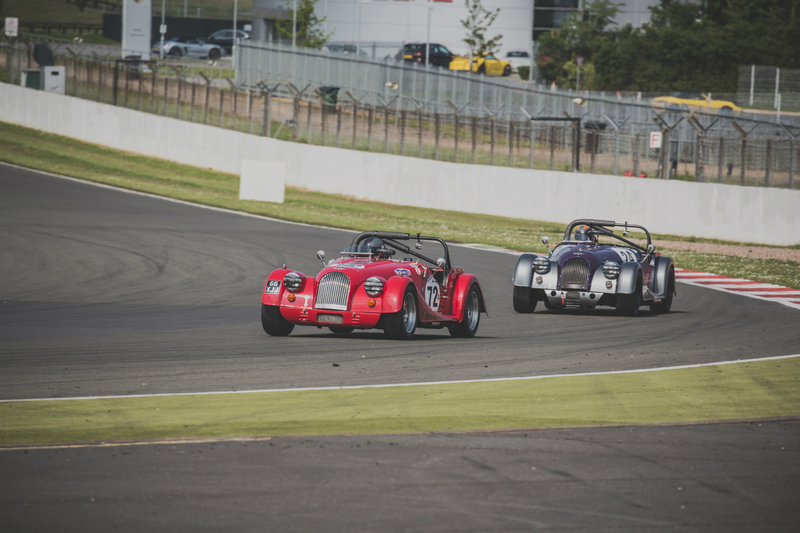 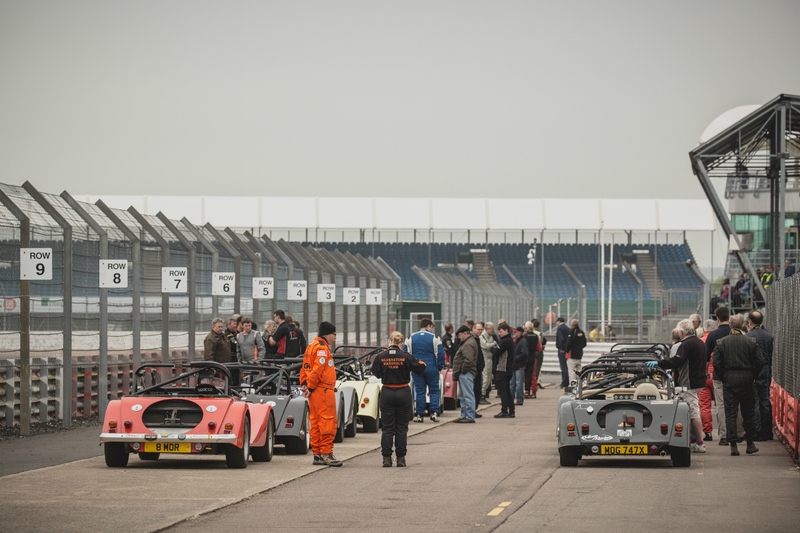 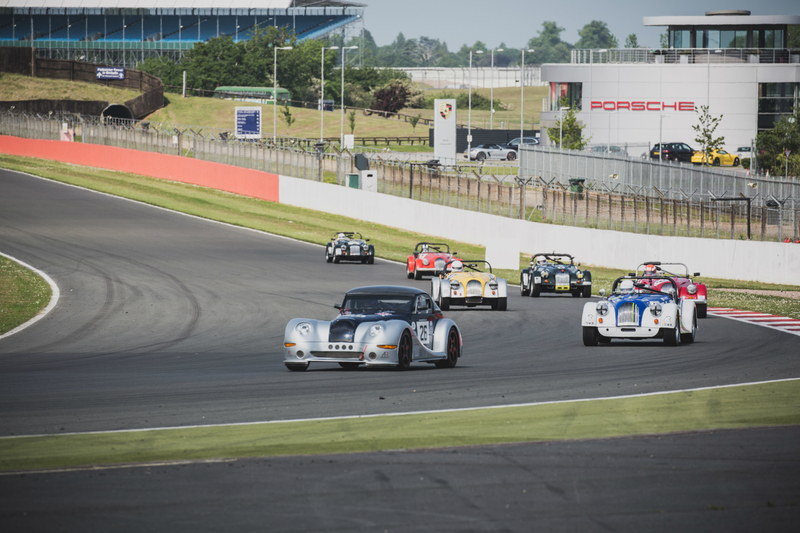 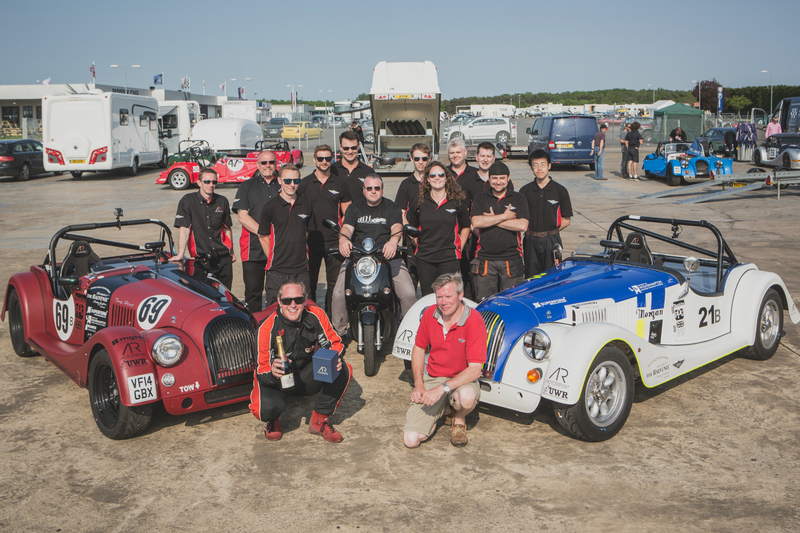 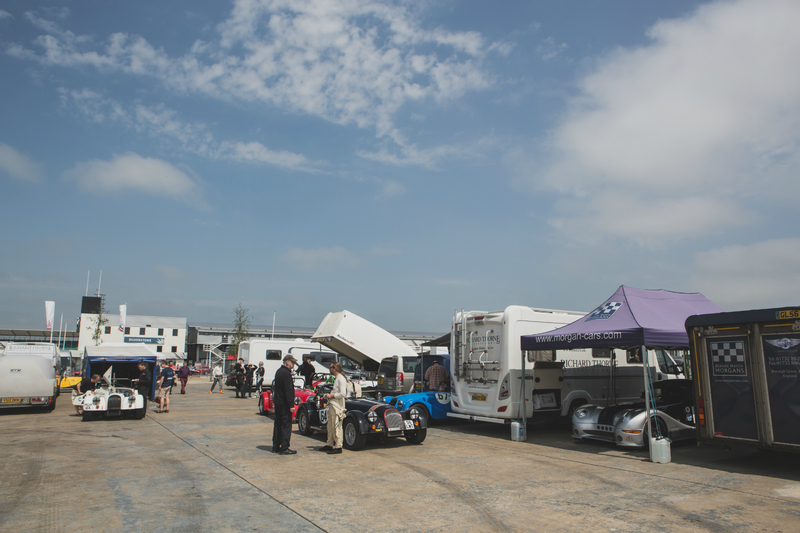 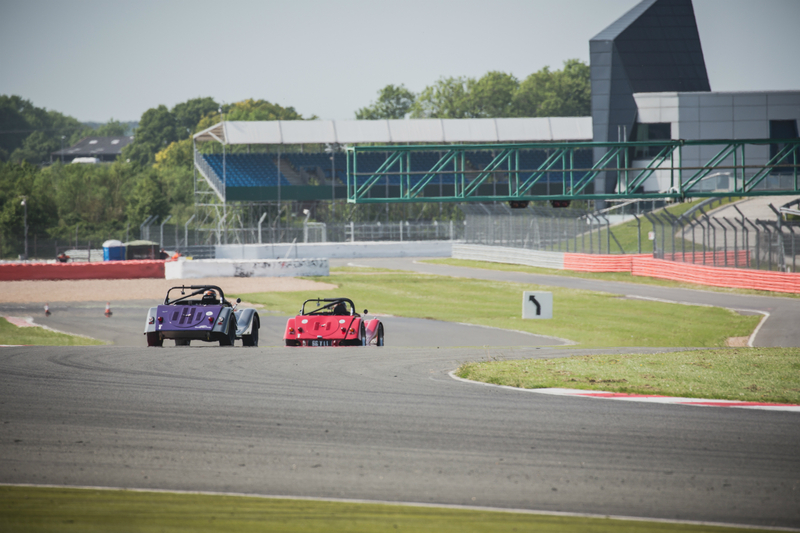 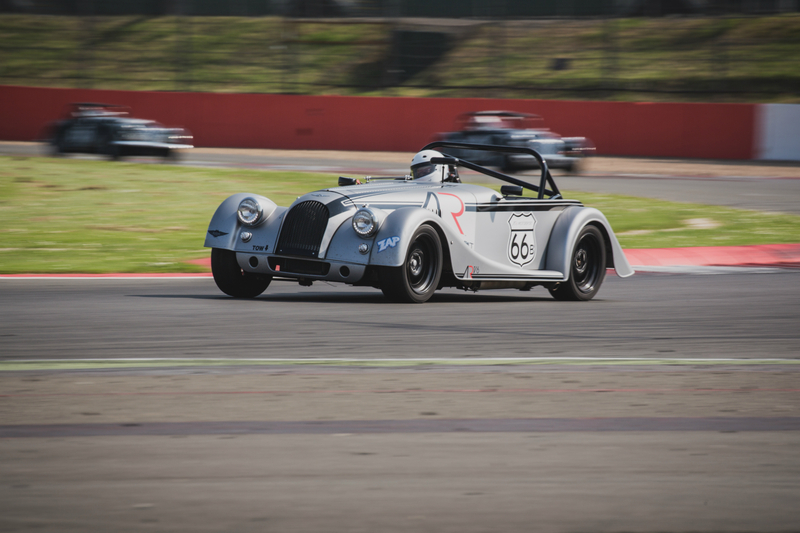 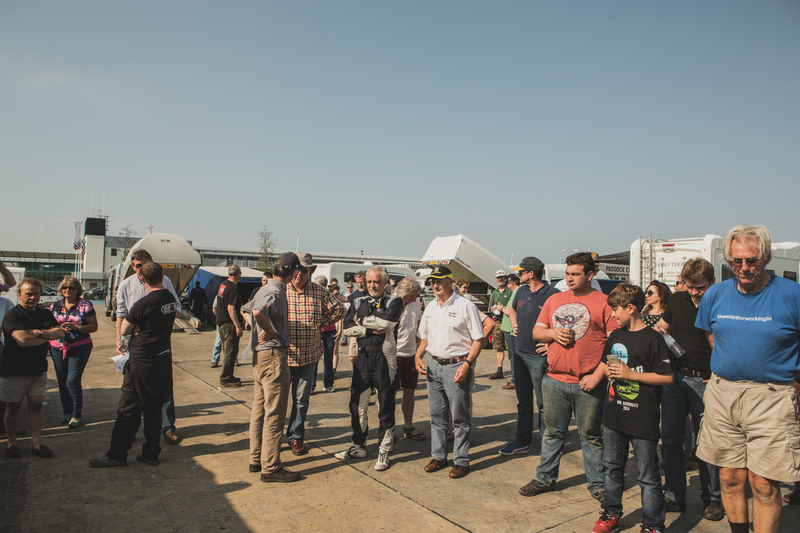 Much to everyone’s delight, the fog had lifted and Silverstone was engulfed in glorious sunshine for the only Morgan Challenge race of the day. 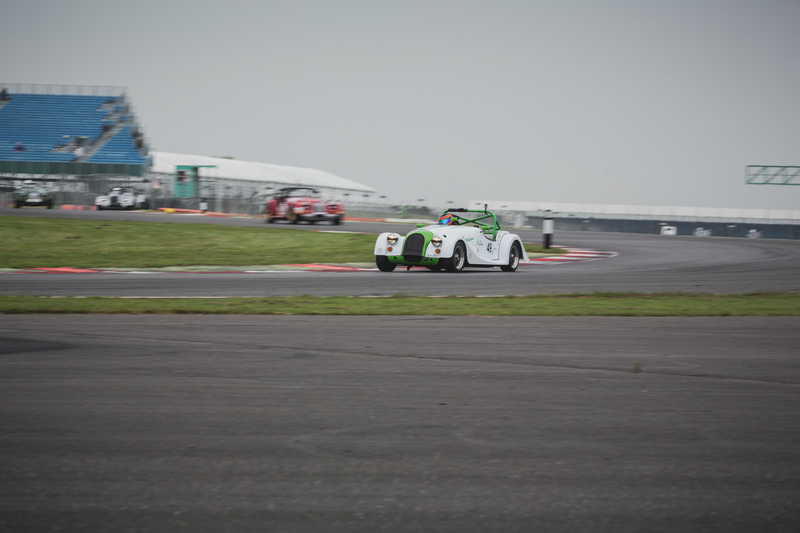 An incident free start saw Keith Ahlers disappear into the distance and dominate from start to finish, lapping all but the top 8 of the grid. 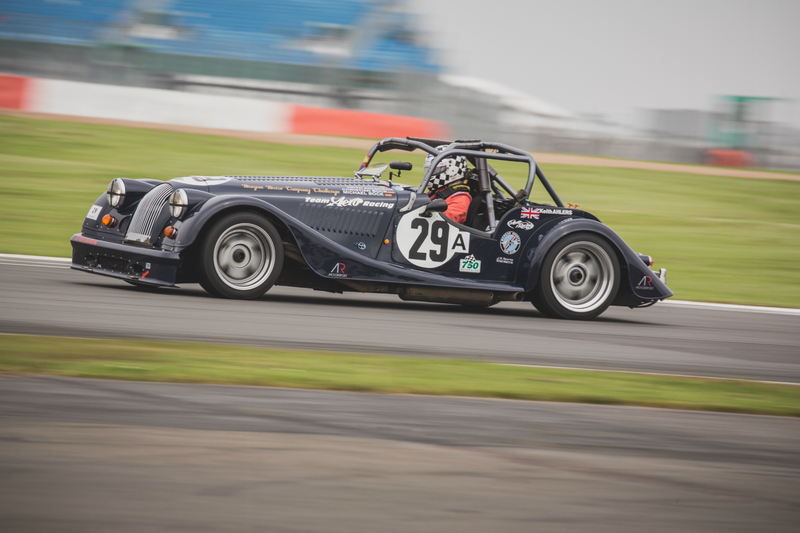 An impressive display as ever from Keith after what was only a minor blip at Donington. 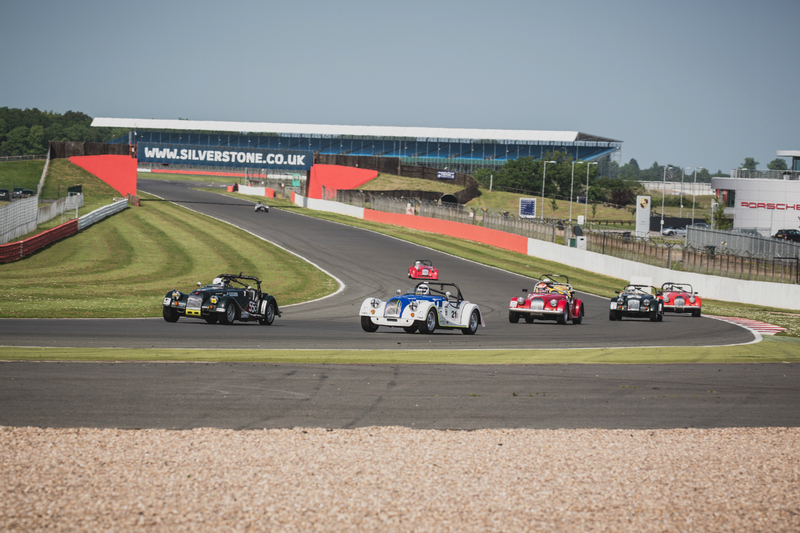 The top 4 finishers in the race reflected that of qualifying, with Russell Paterson finishing just in front of son Elliot to take 2nd place overall. 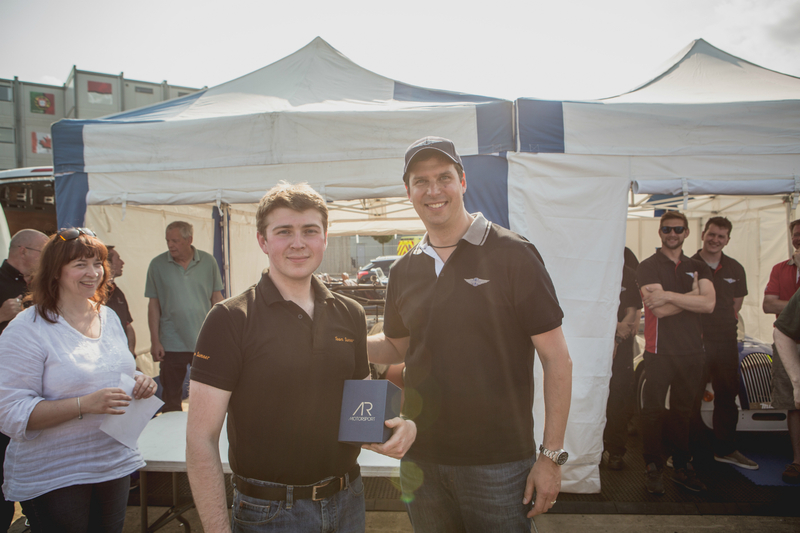 Another fine display of driving from Elliot Patterson saw him take another Class B victory and 3rd overall. 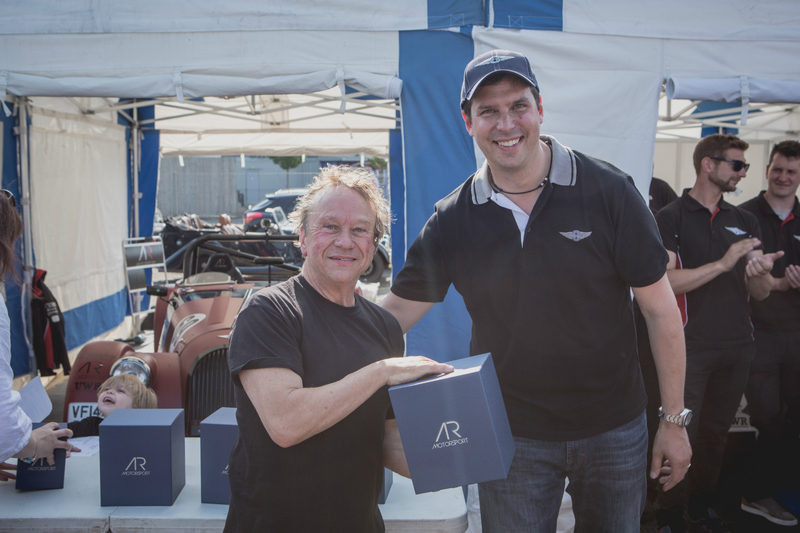 4th place overall and 2nd in Class B was deservedly taken by Tony Hirst in the ARV6. 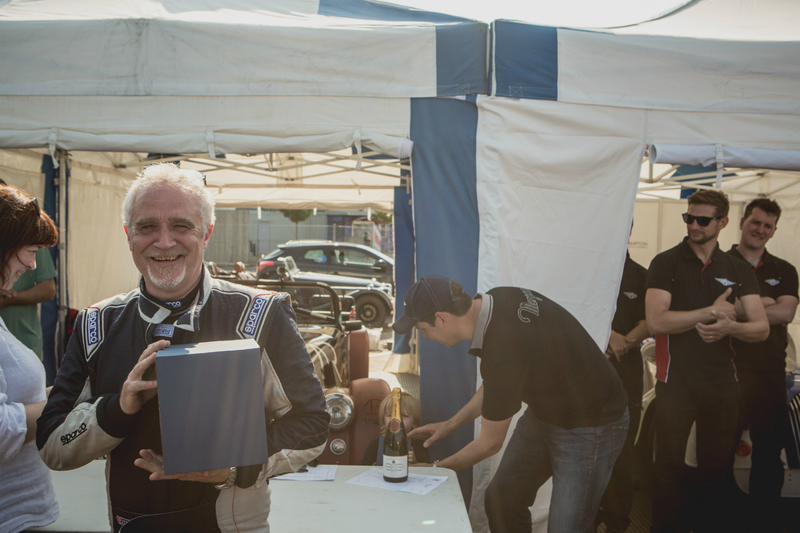 Some very committed driving from Tony to regain positions from Jerry Knight and Andrew Thompson, a daring double overtake on the way into Stowe secured driver of the day and a bottle of champagne for the ecstatic Mr Hirst! 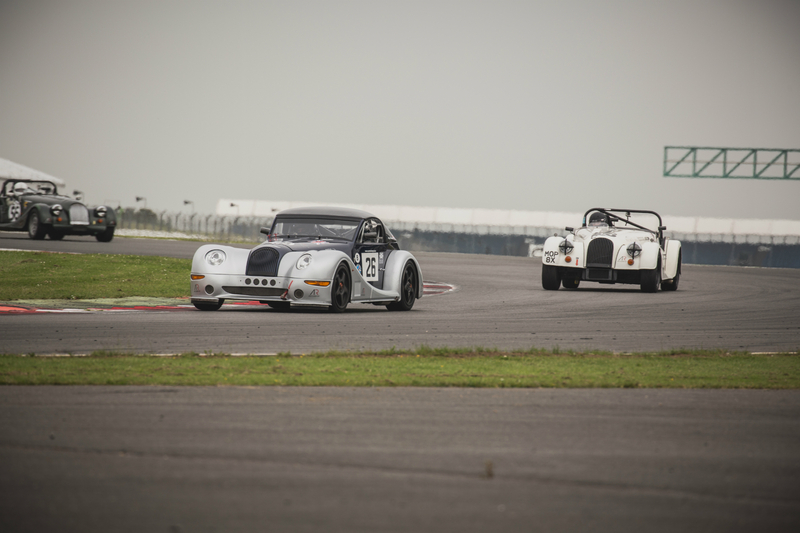 Less than a second separated Jerry and Andrew, who took Class A & B 3rds respectively. 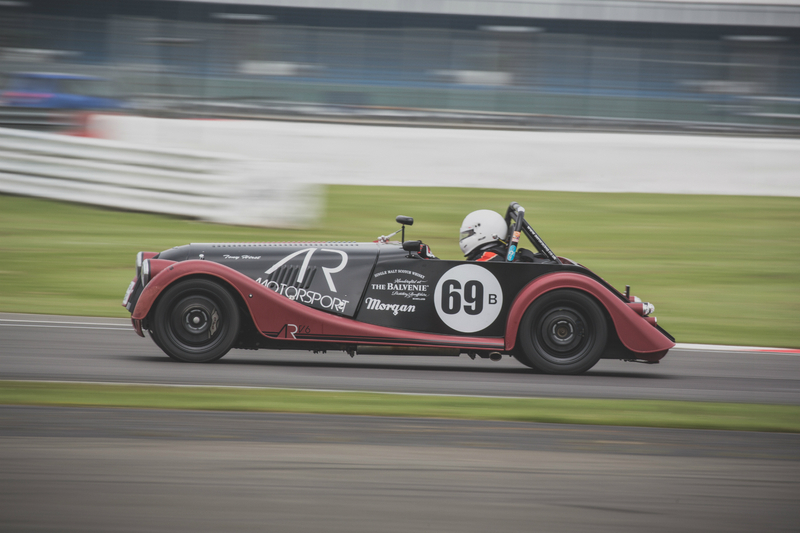 Tim Parsons set fastest lap on his way to Class R victory, finishing ahead of fellow class competitors Kelvin Laidlaw and Simon Scott. 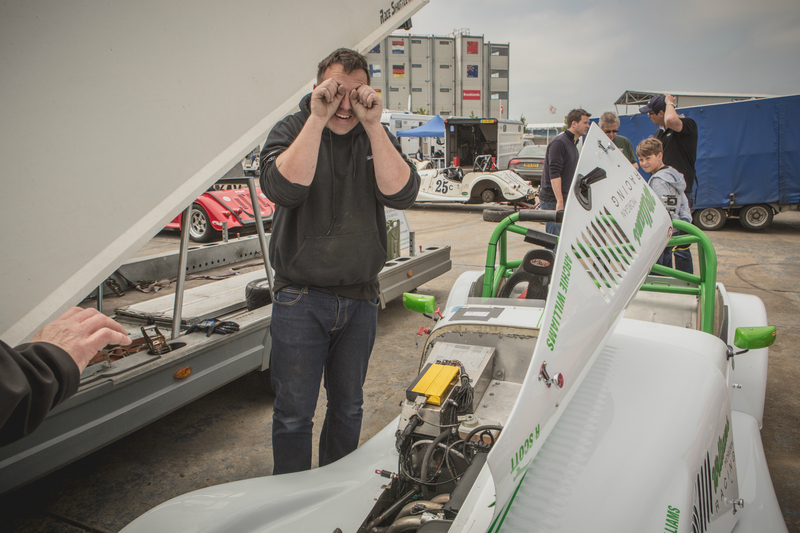 Another Class C victory for Tim Ayres who was closely followed by Philip Tisdall and Steve McDonald to complete the top 3 in Class C. A fine drive from Philip Tisdall to set the fastest Class C lap, unfortunately not quite enough to take the win. 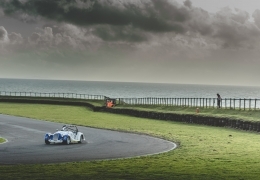 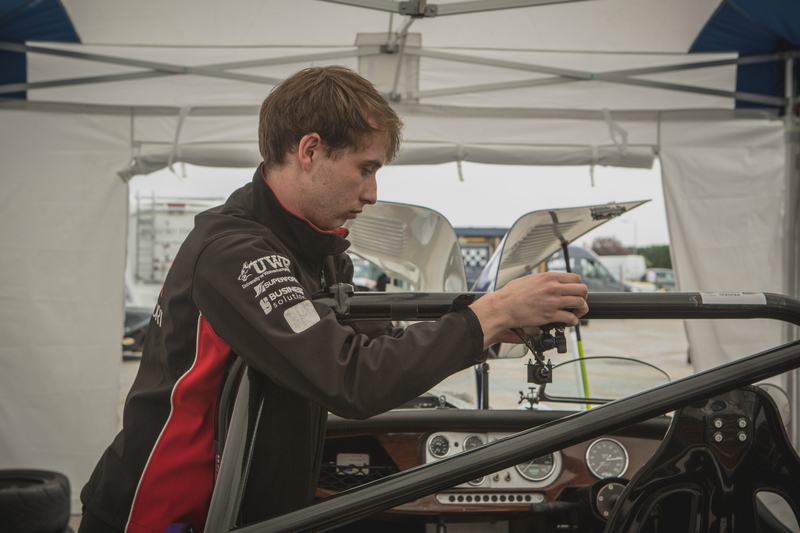 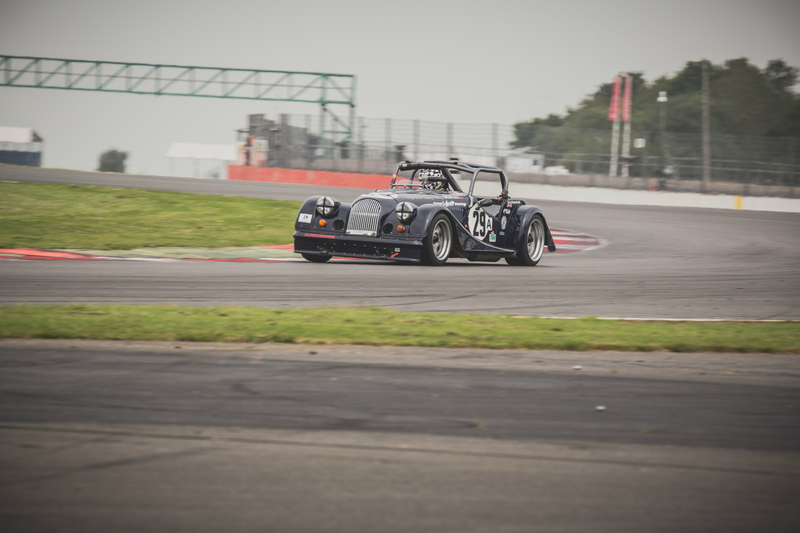 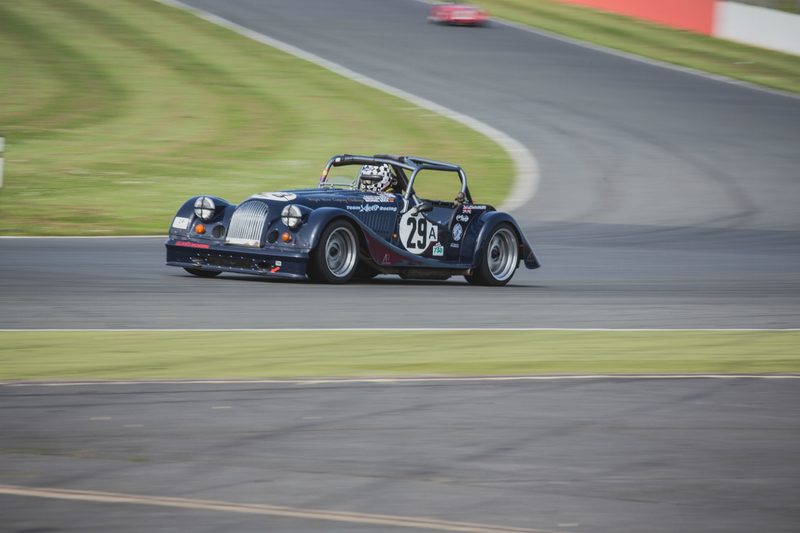 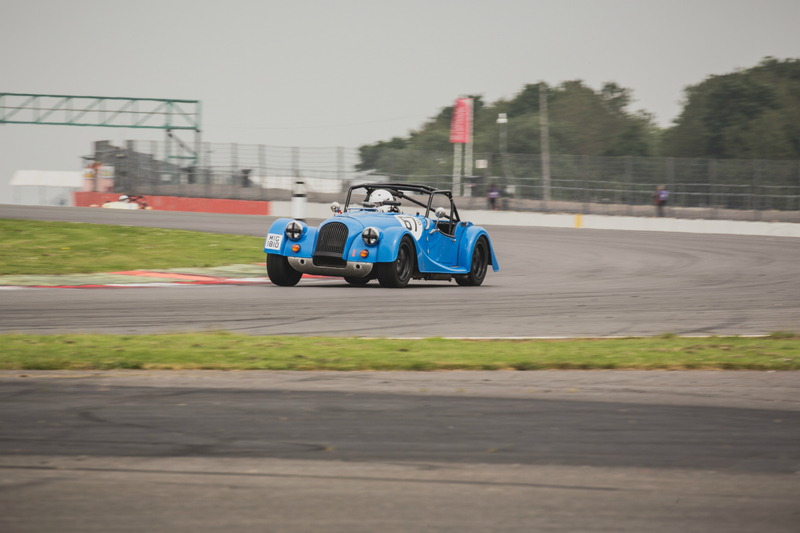 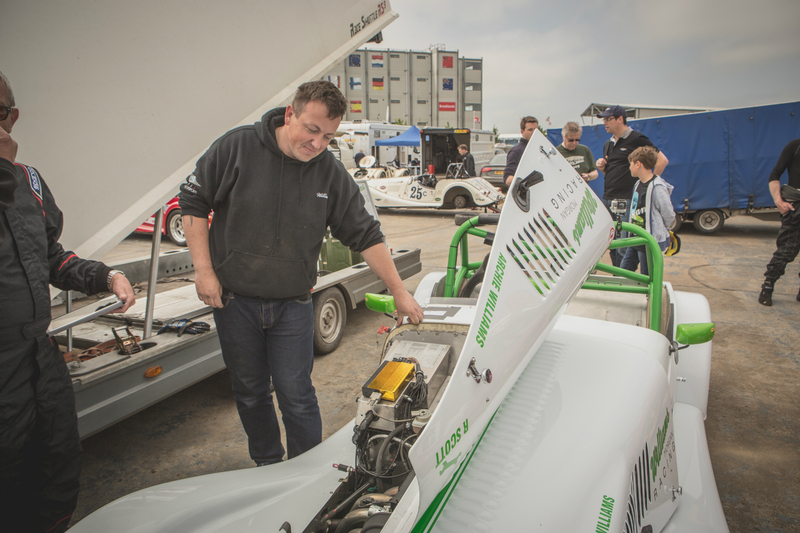 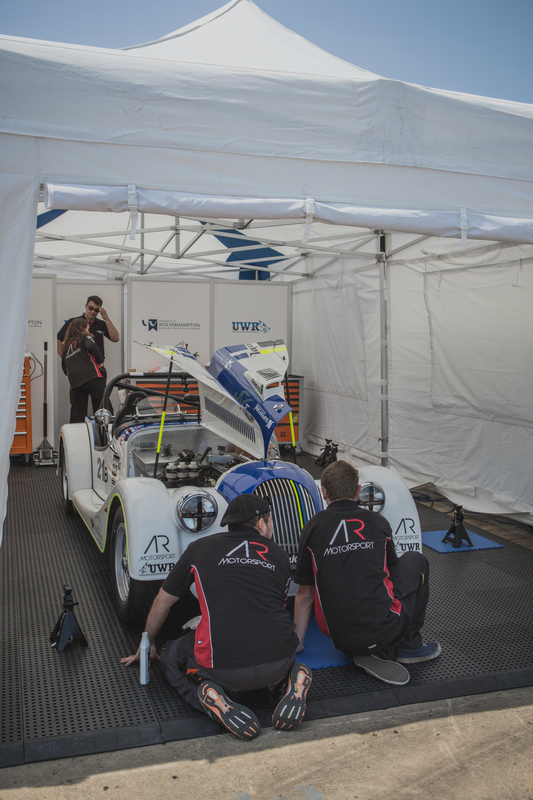 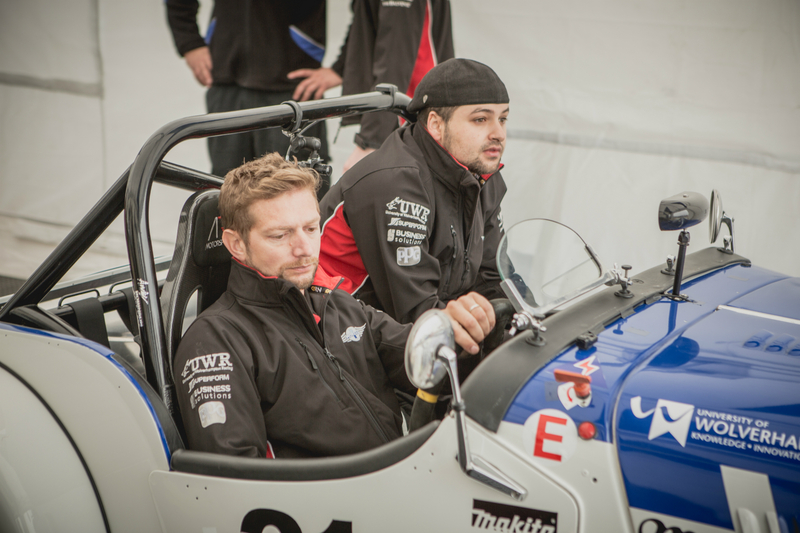 Further down the grid and persistence paid off for Craig Hamilton-Smith in the UWRacing Plus4. 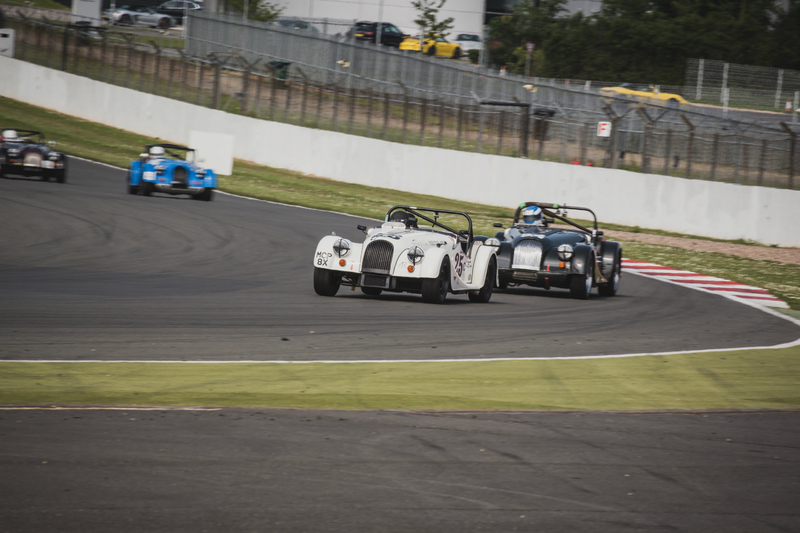 Craig and Greg Parnell have had some brilliant battles so far this season, with Craig managing to make a move and hold position ahead of Greg towards the end of the race. 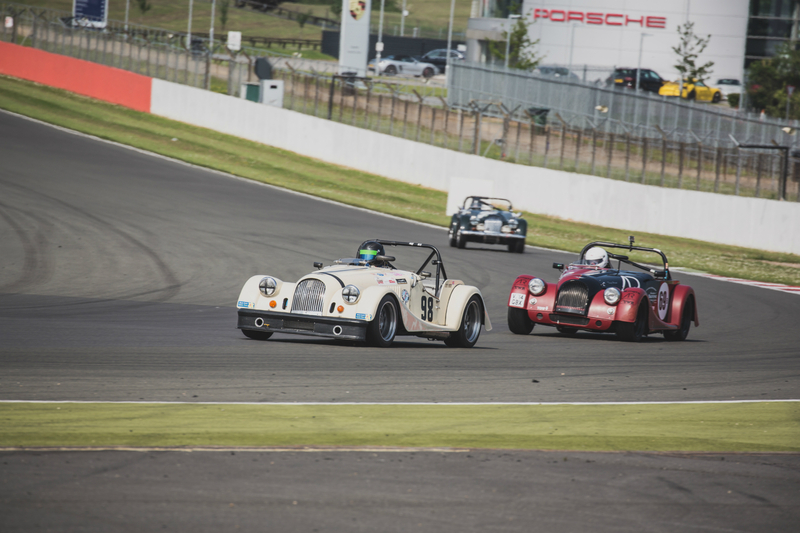 Class wins for Paul Bryan and Ian Sumner in classes D and E respectively rounded off the results for another exciting race. 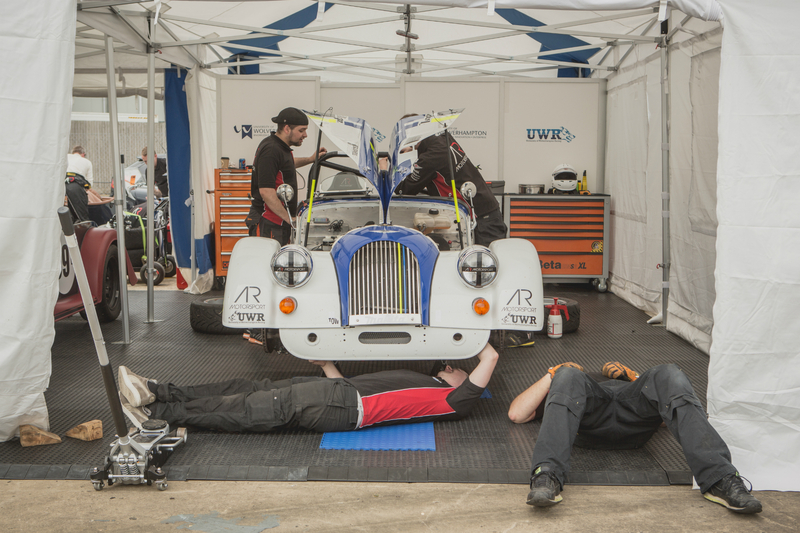 We’re now at the half way point in the 2016 season. 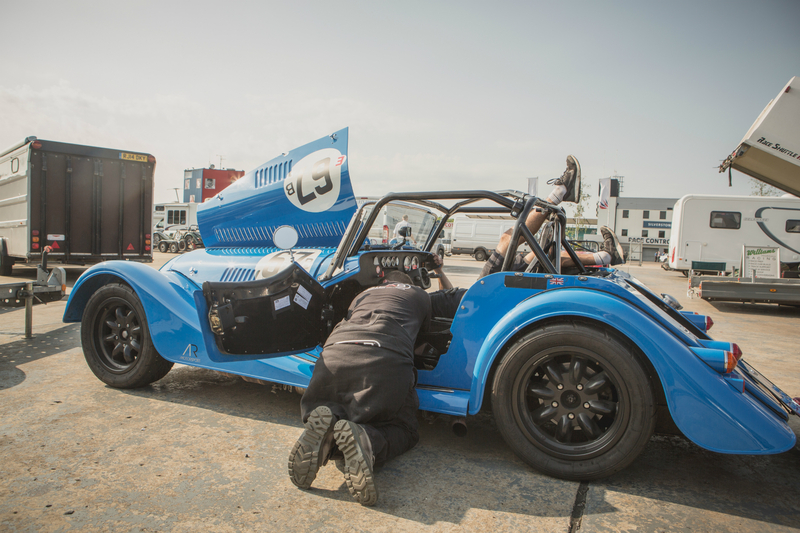 How have you found the first half of your debut season and what’s been the biggest challenge? 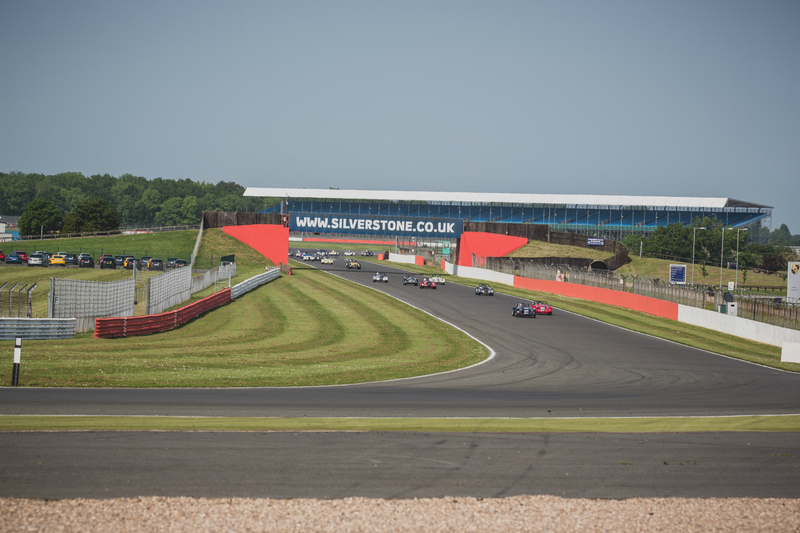 The second of two races at Silverstone this year, having now raced both the National and GP circuits recently, which is your favourite and why? 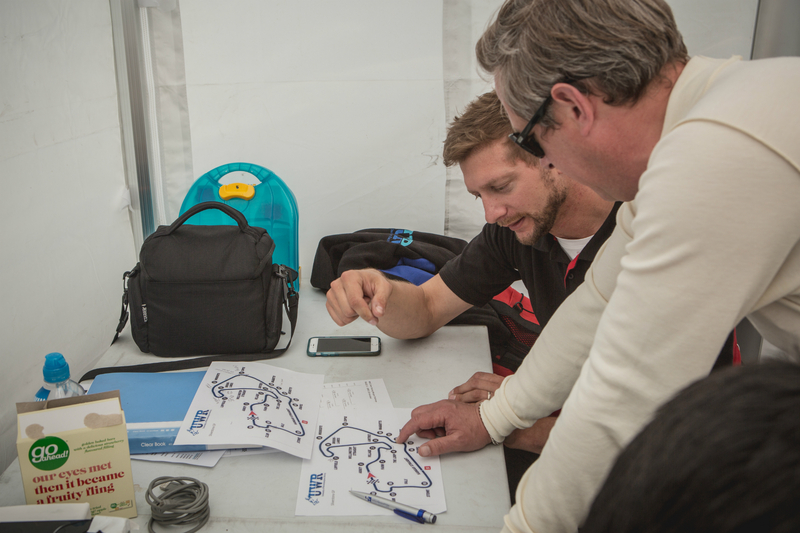 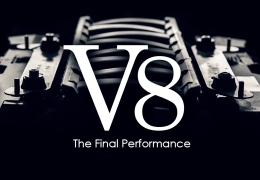 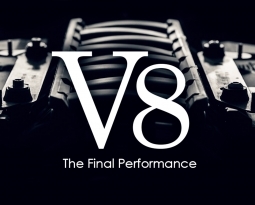 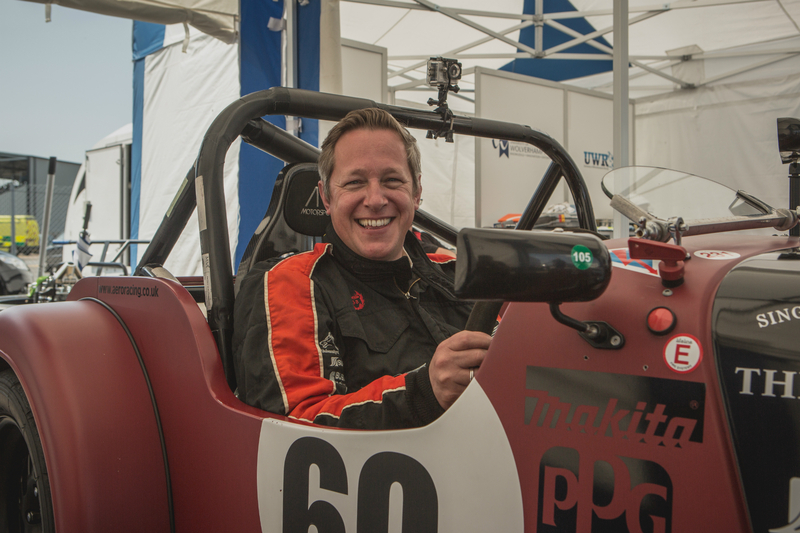 You qualified well and had yet another battle with Greg Parnell, talk us through the race from your perspective? 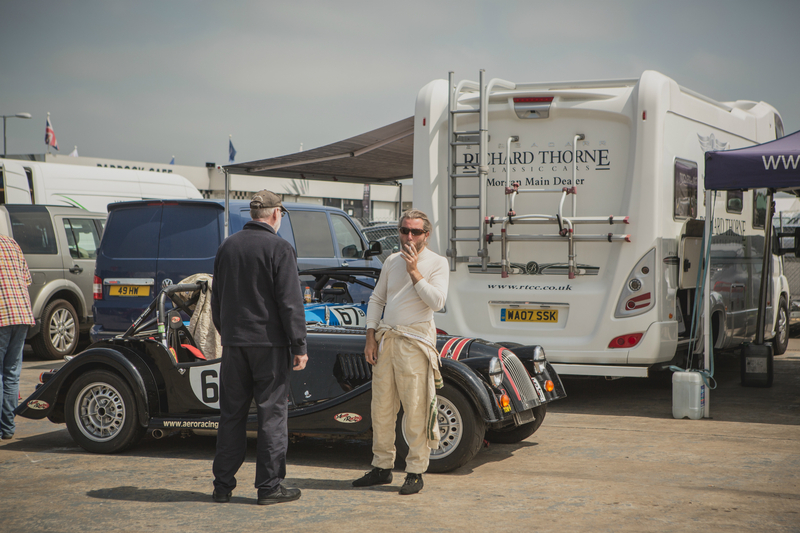 You were absent for the last race at Donington, is that a circuit you usually enjoy? 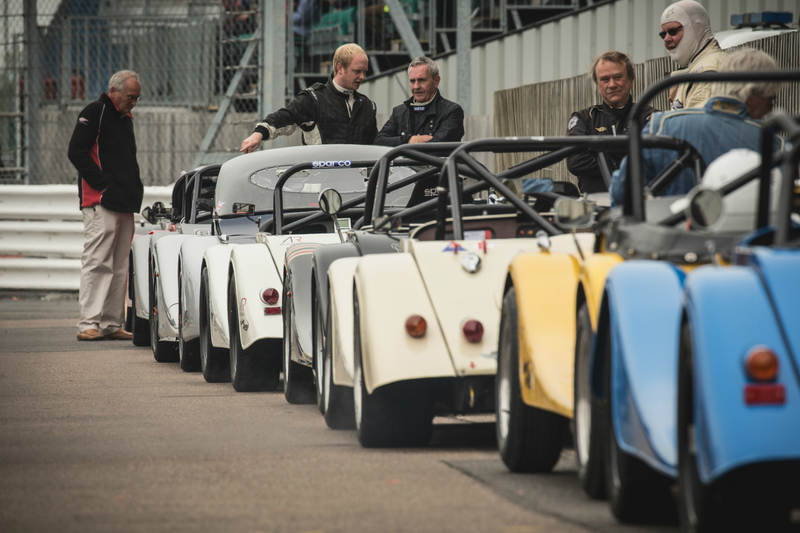 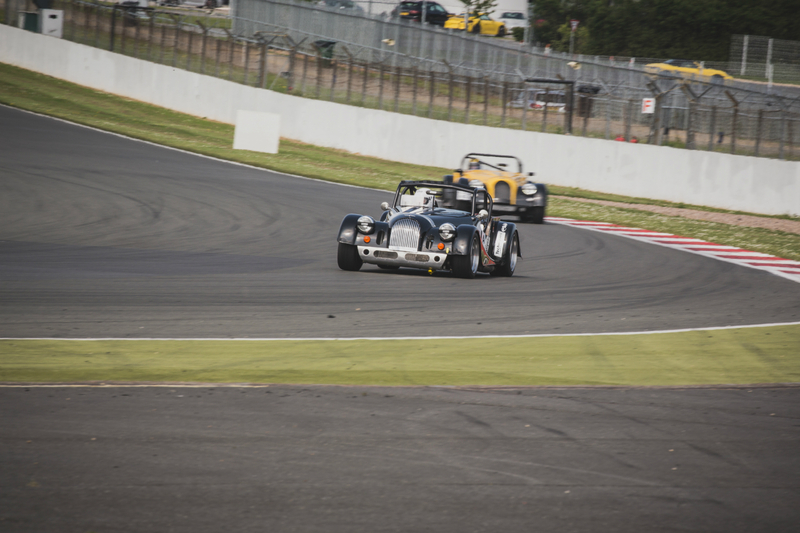 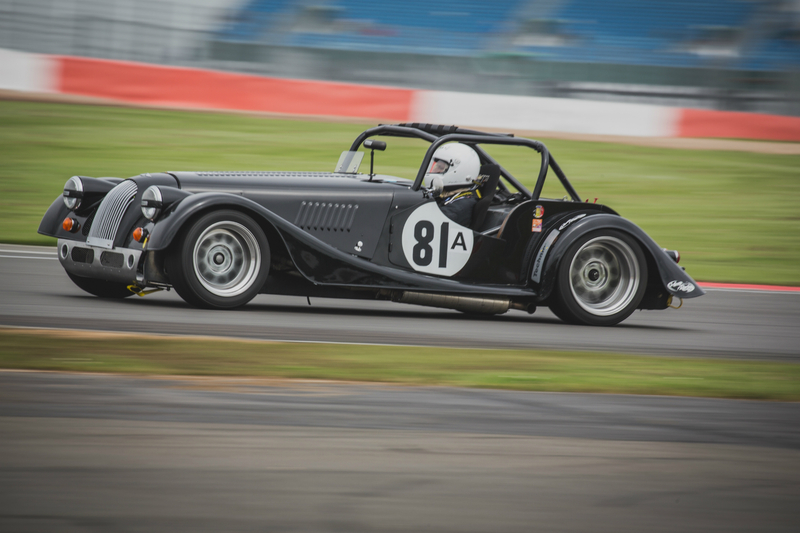 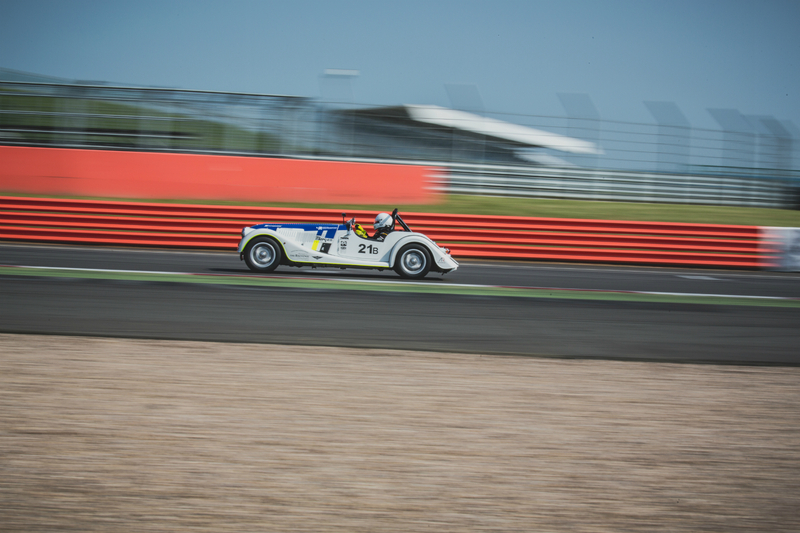 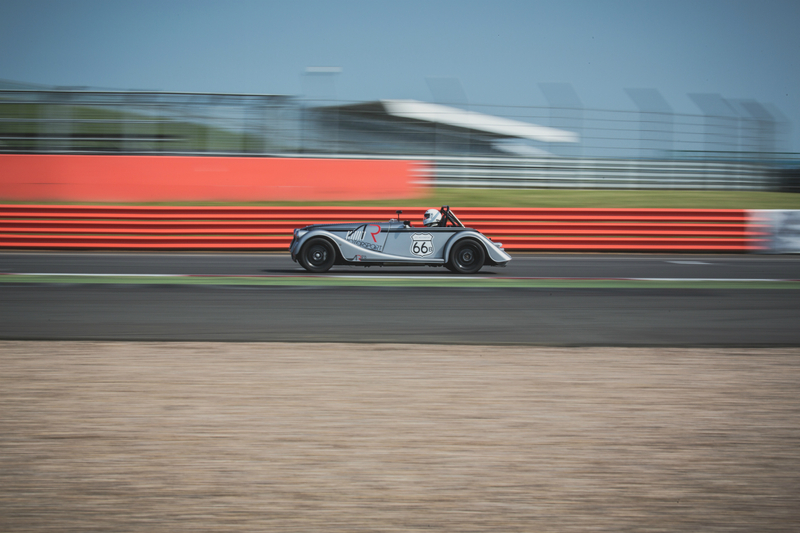 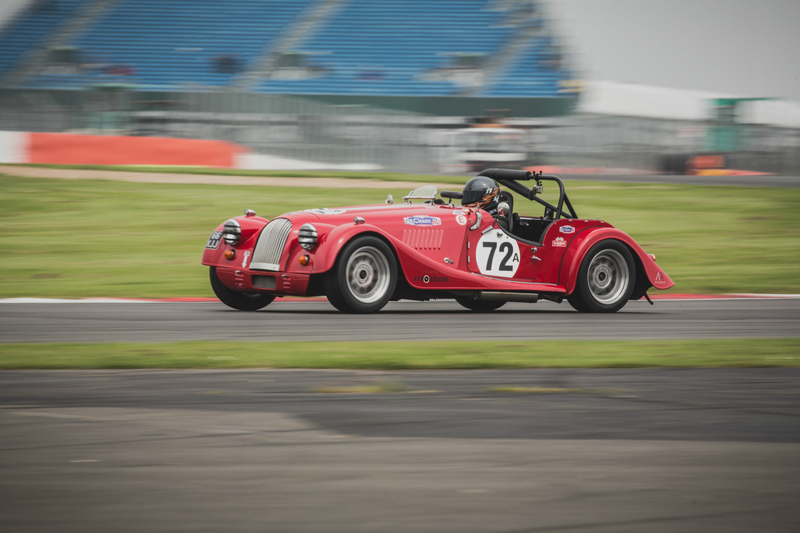 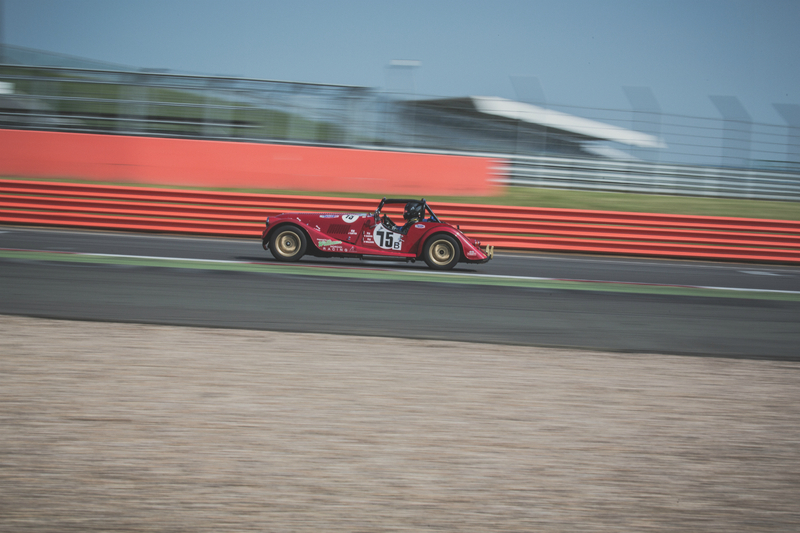 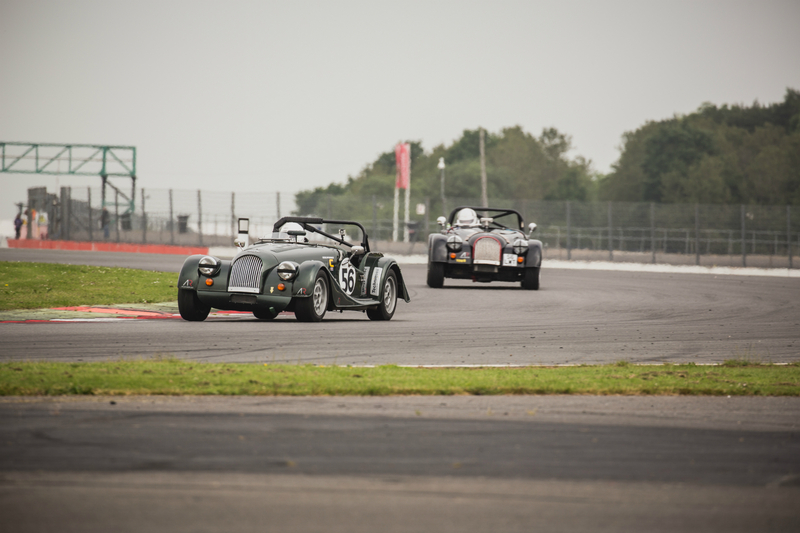 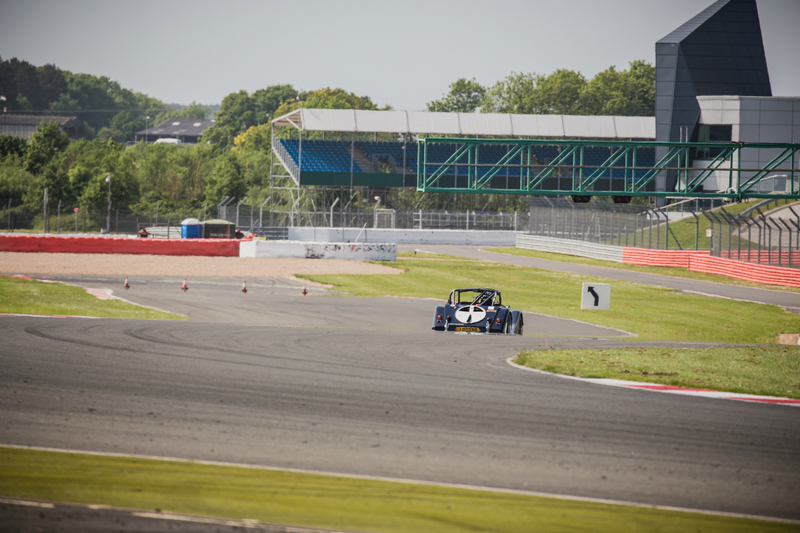 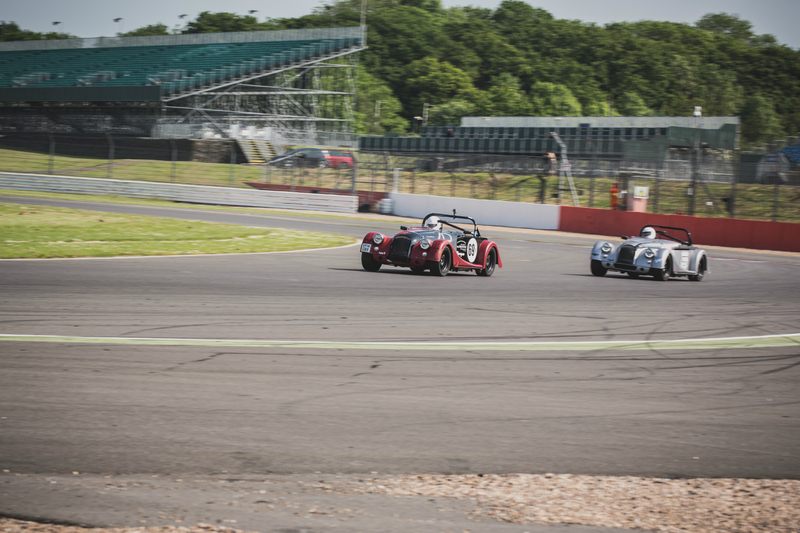 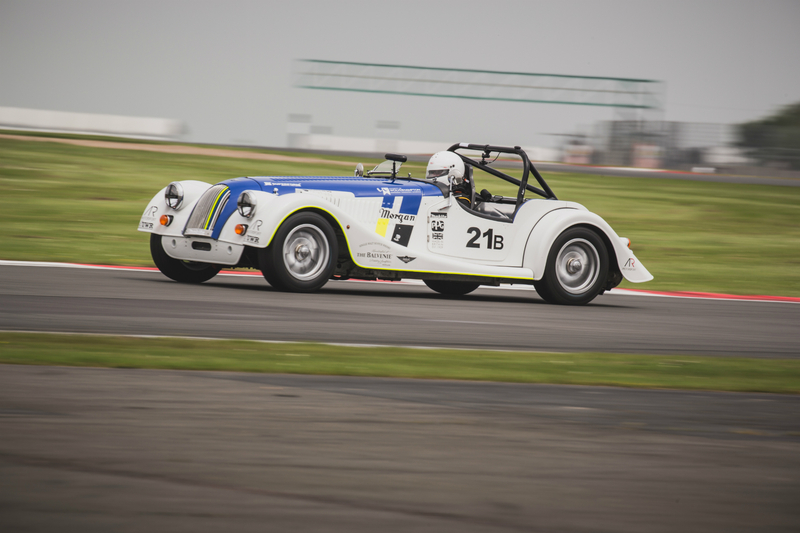 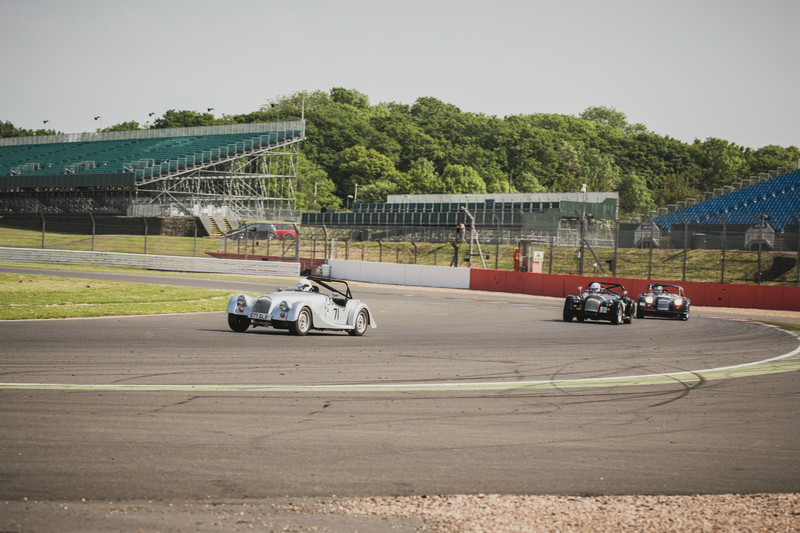 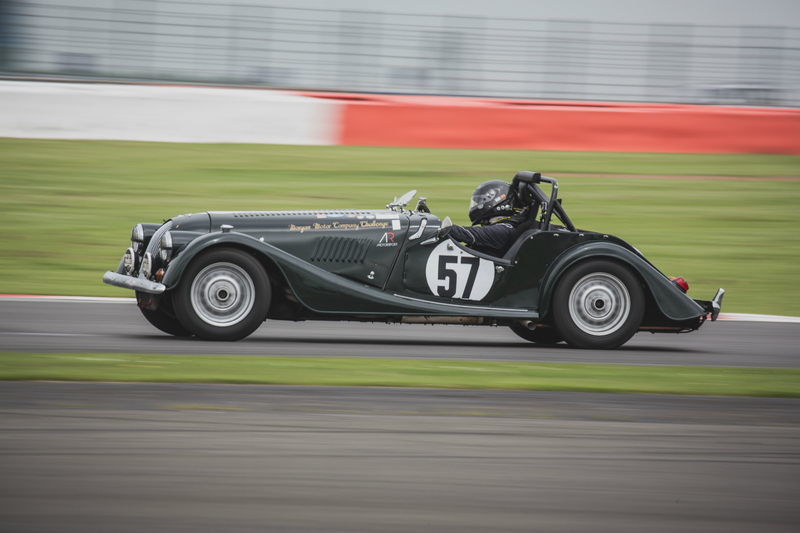 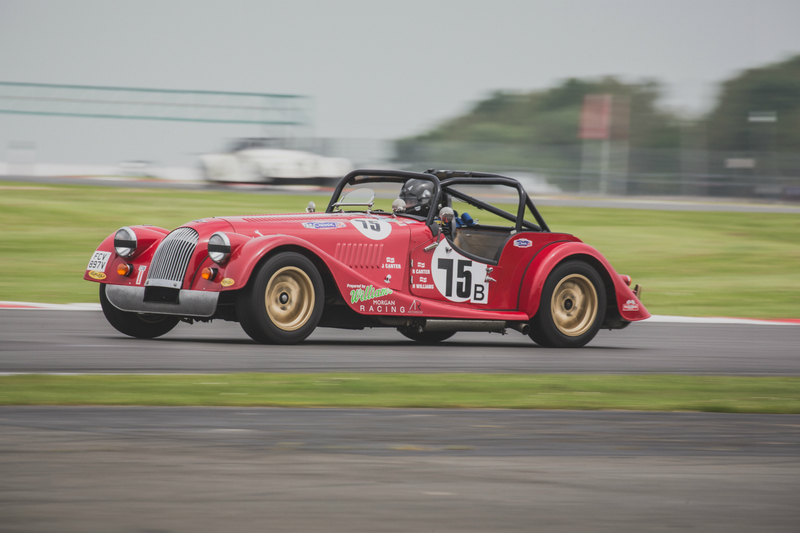 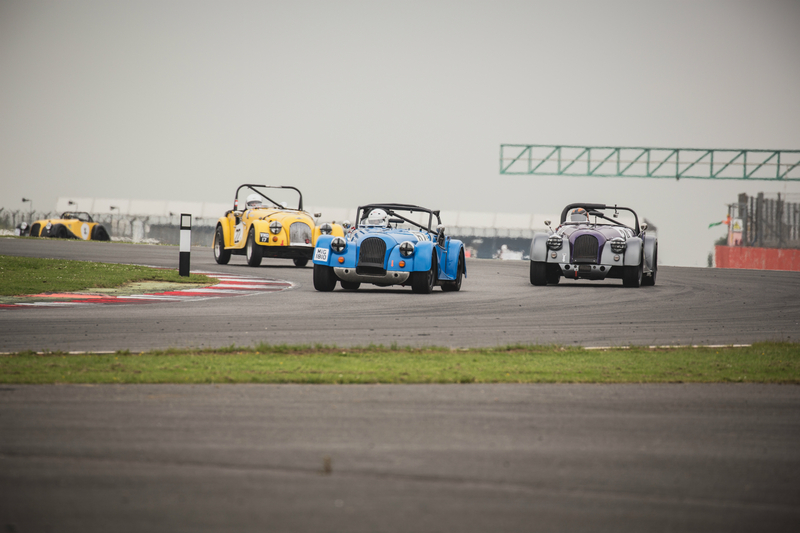 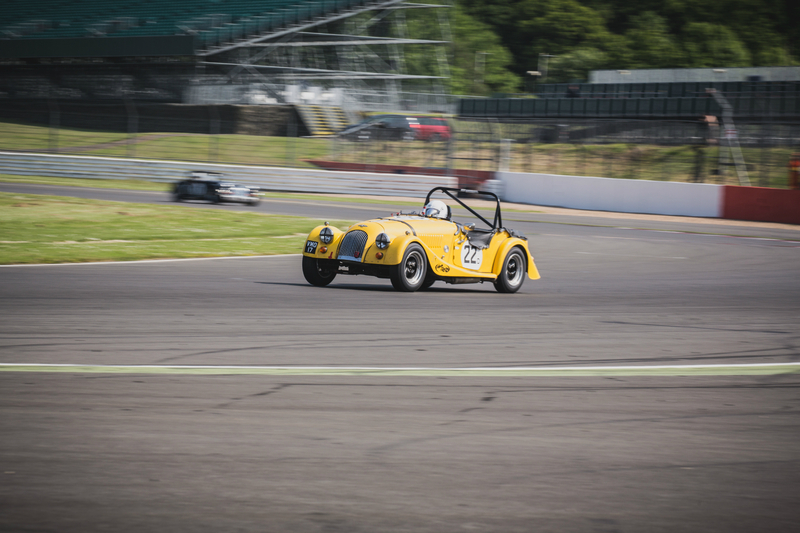 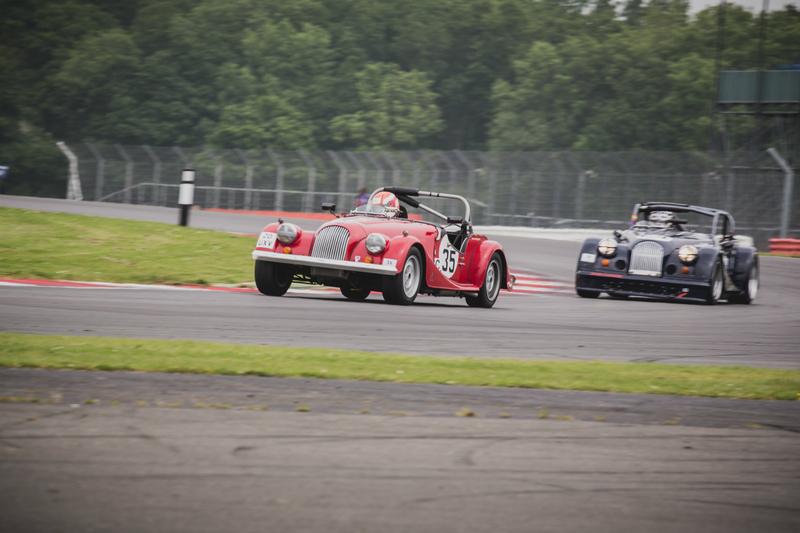 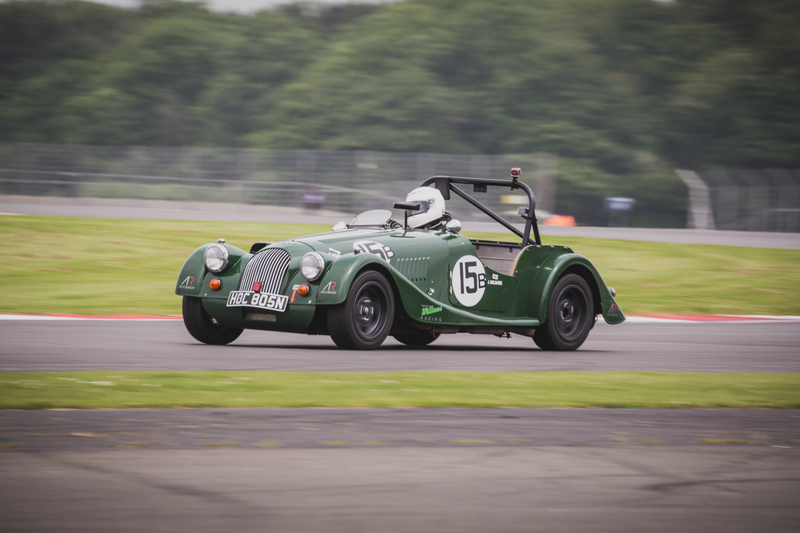 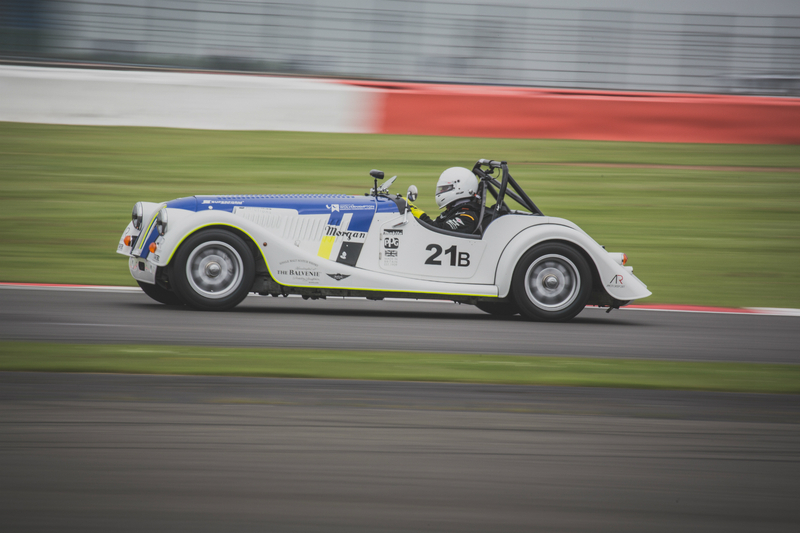 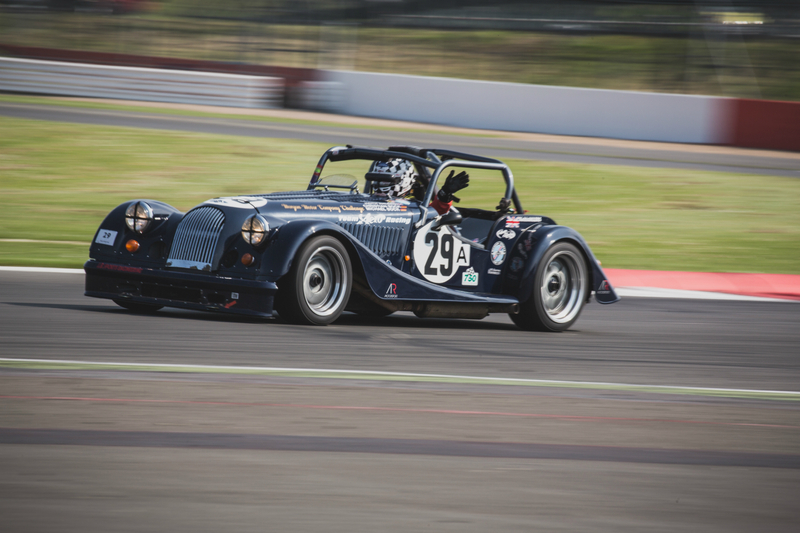 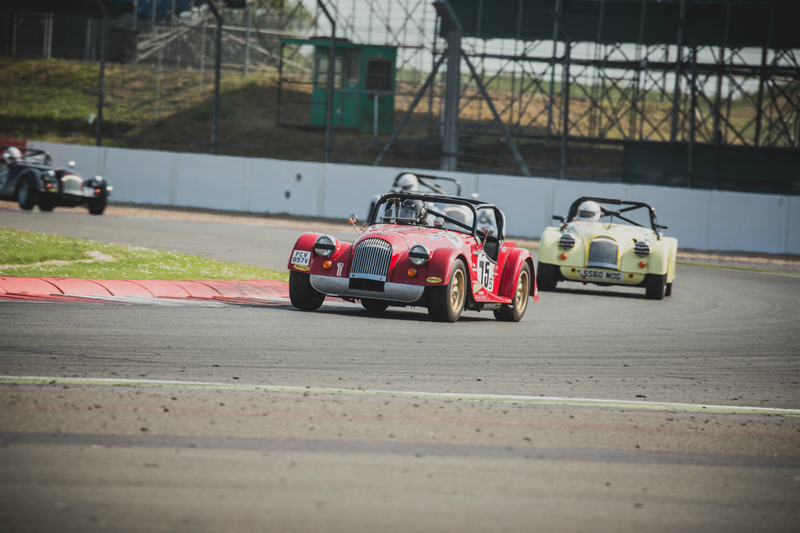 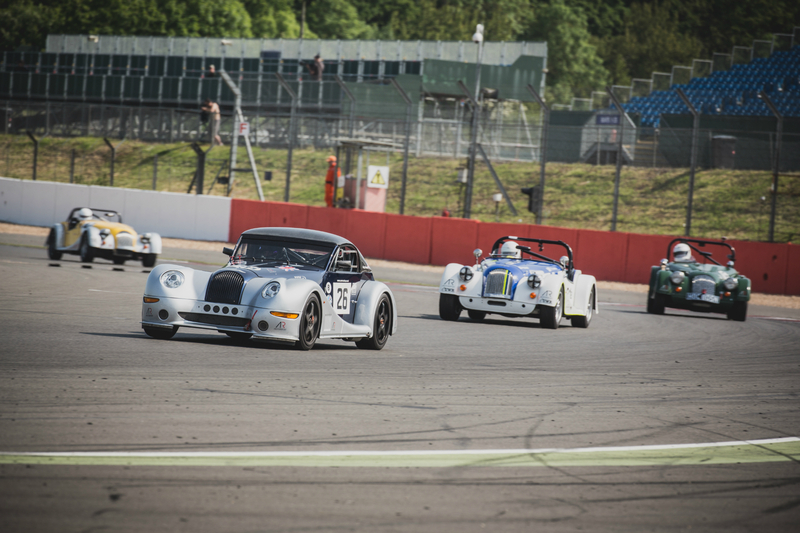 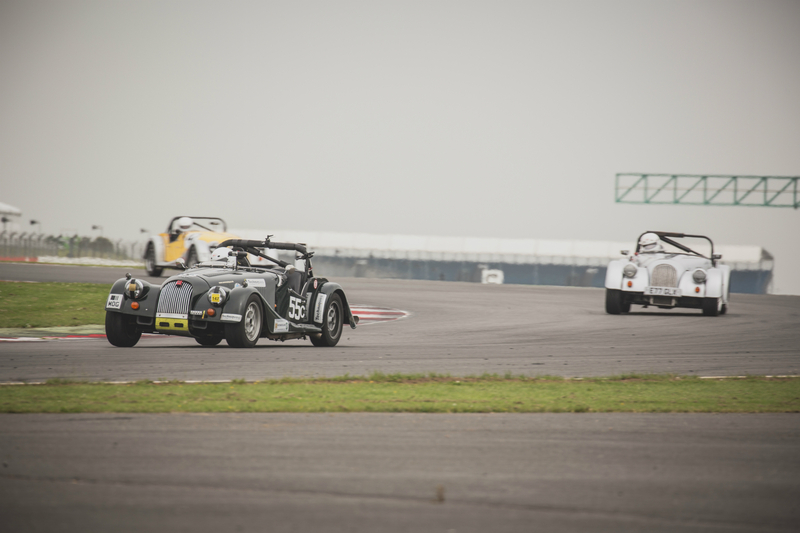 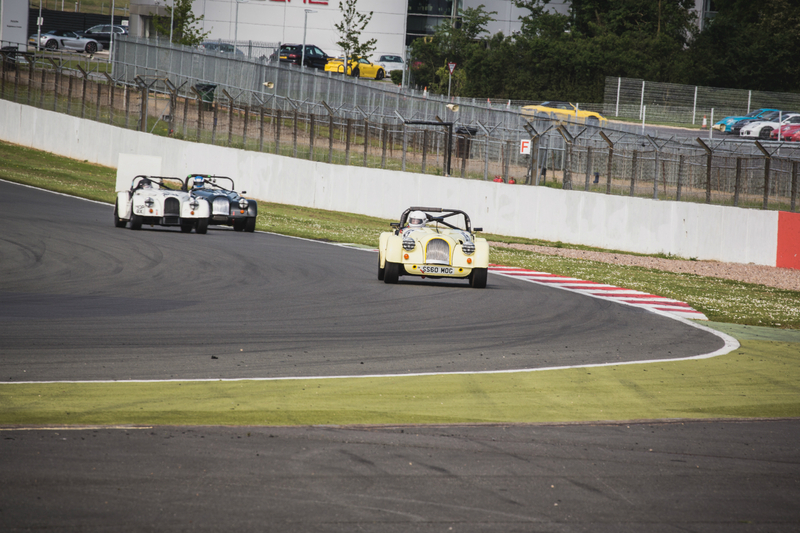 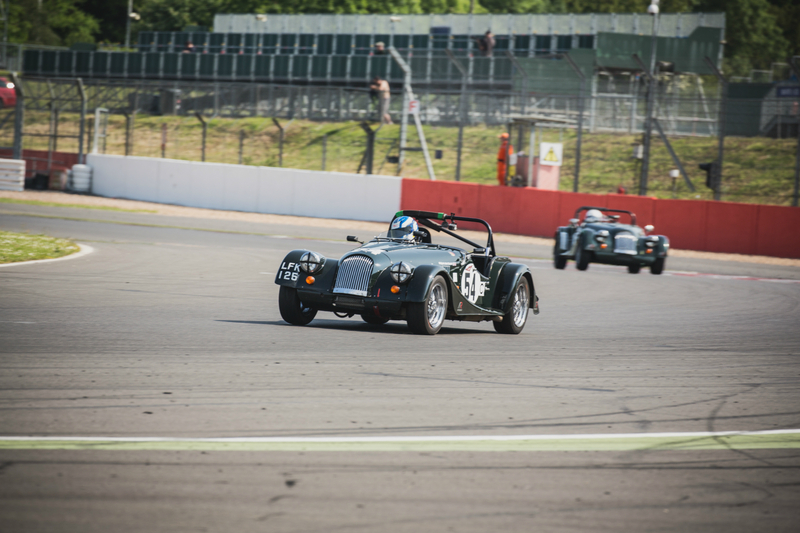 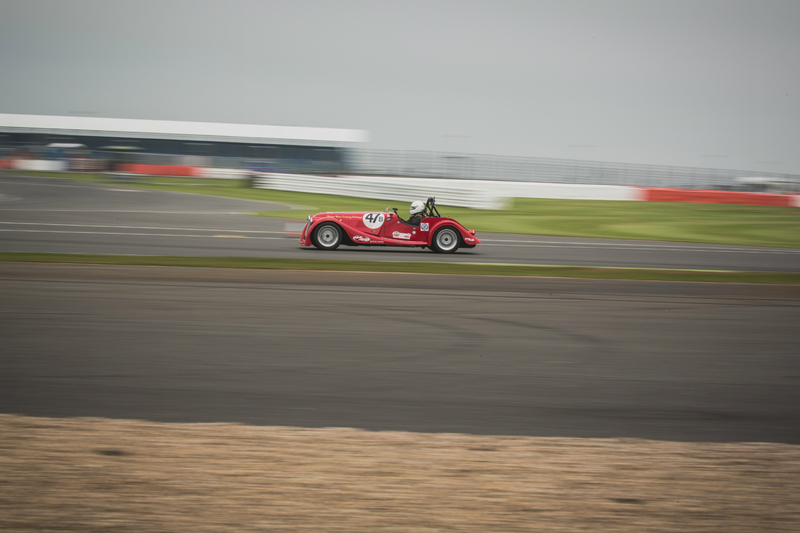 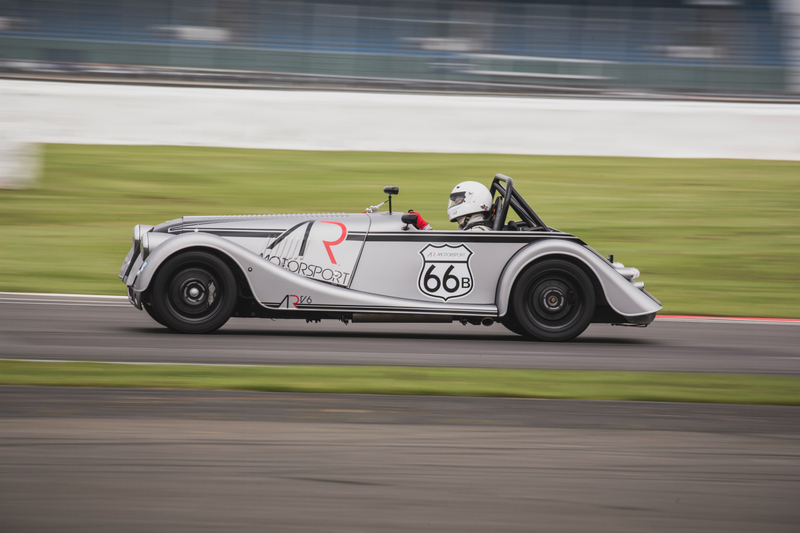 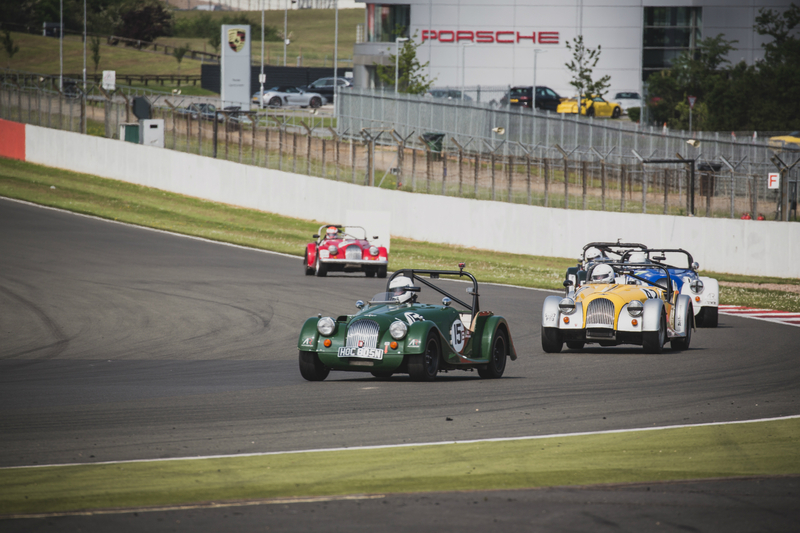 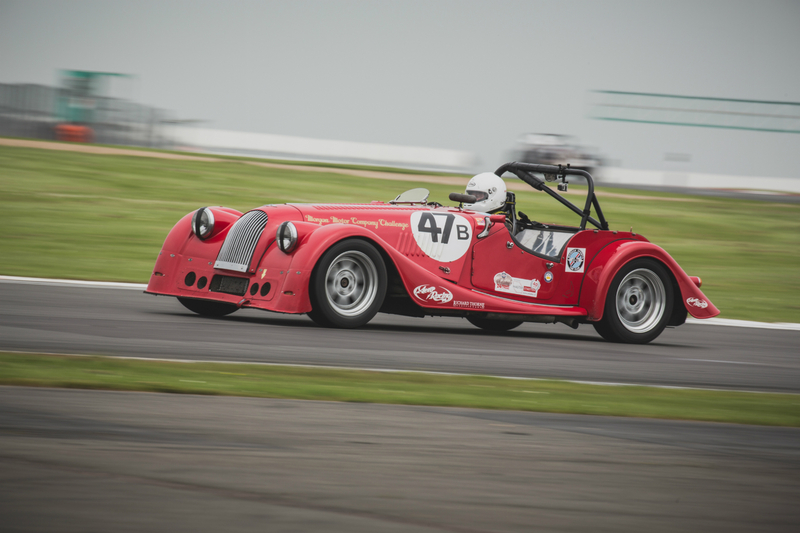 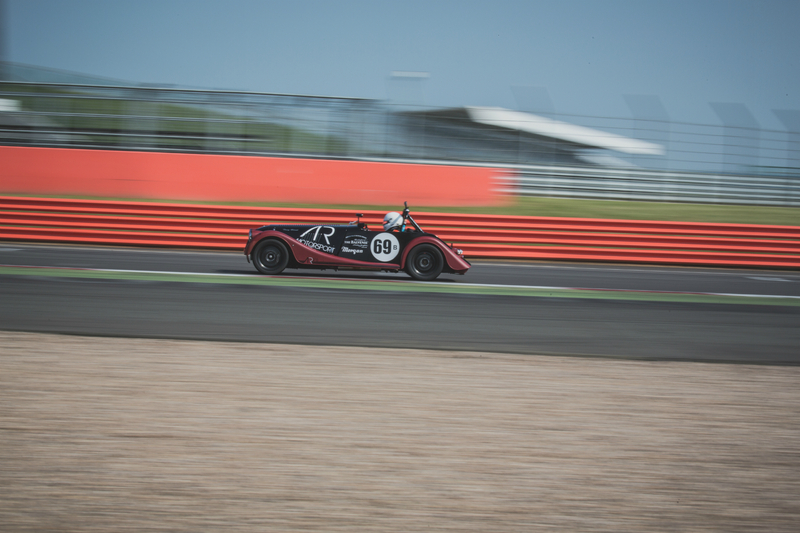 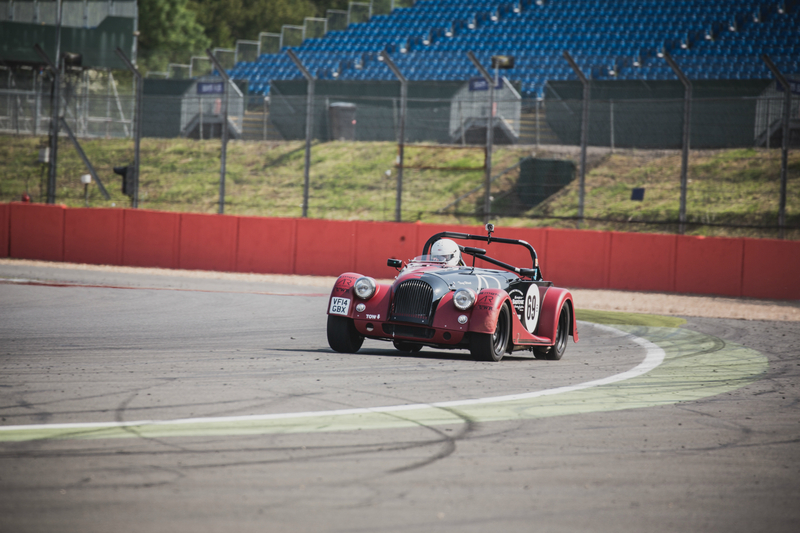 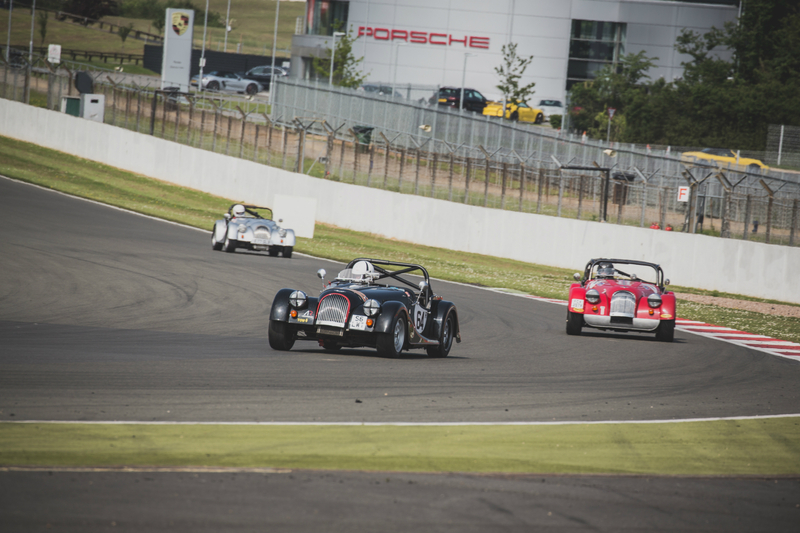 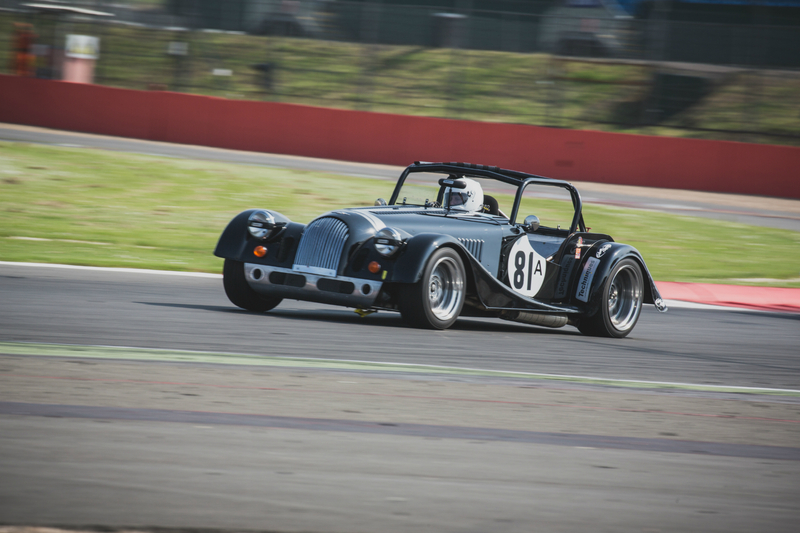 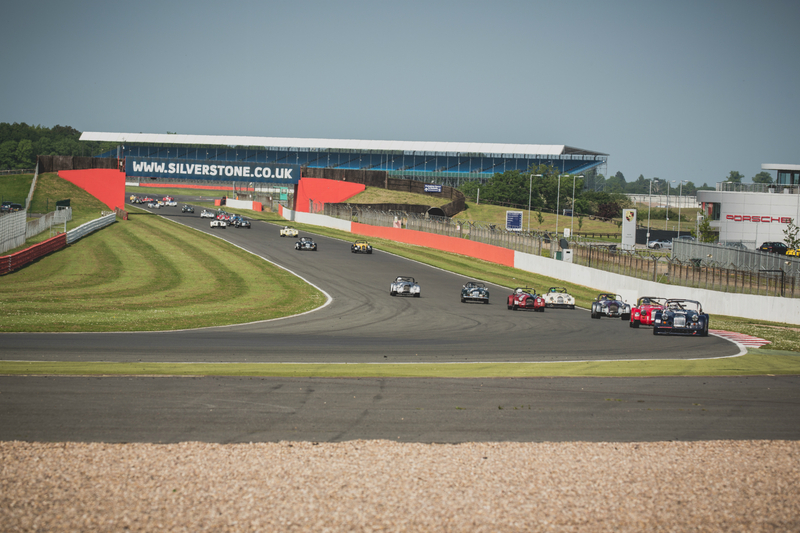 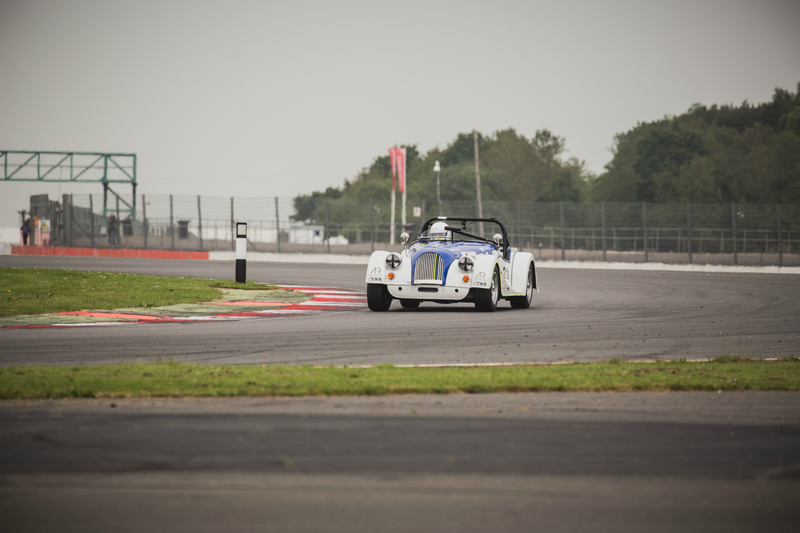 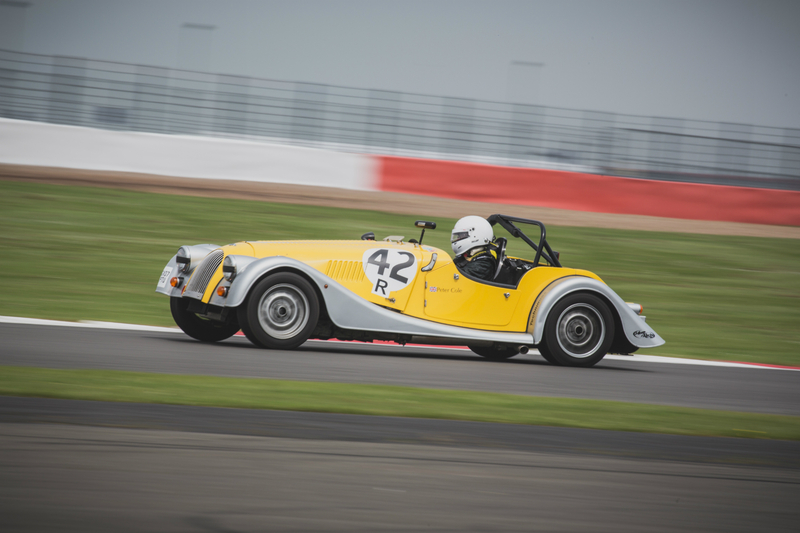 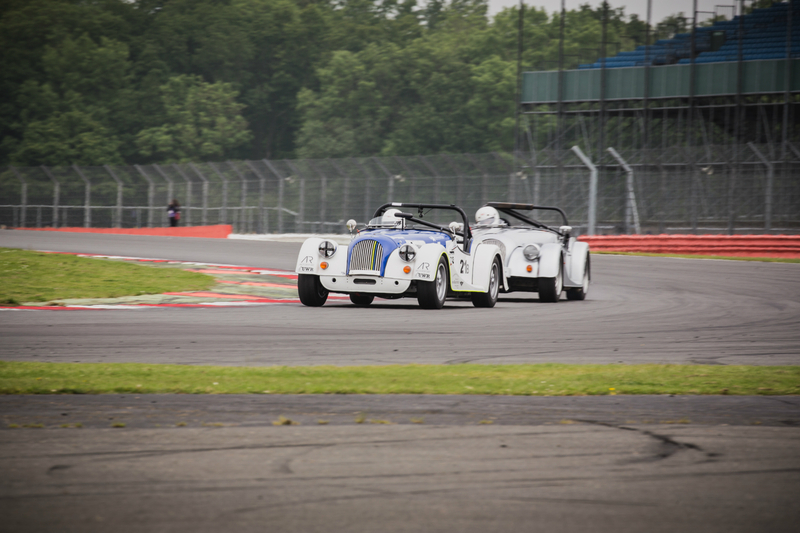 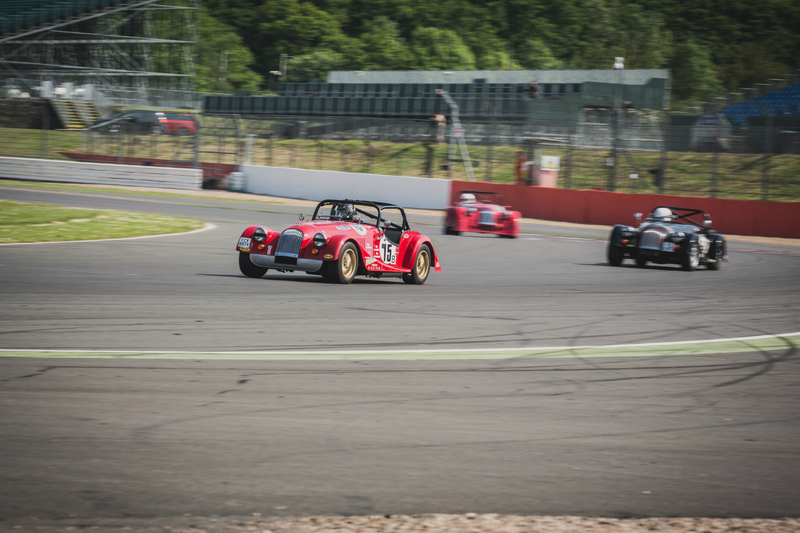 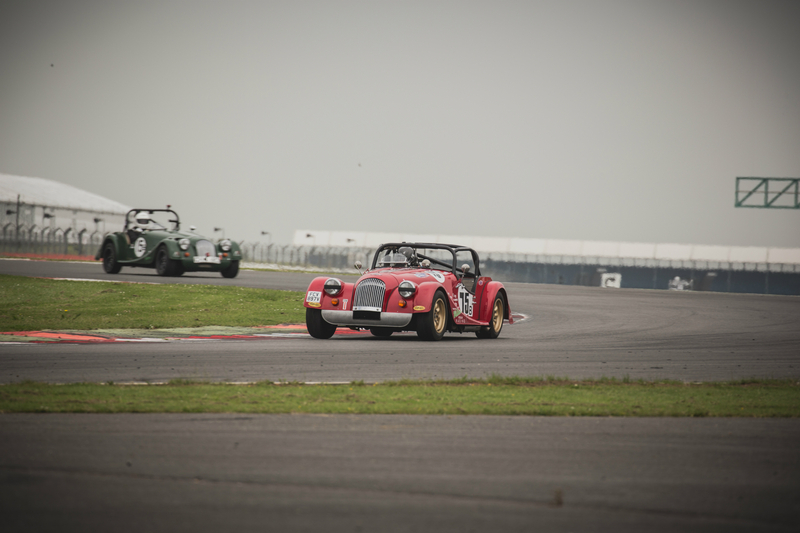 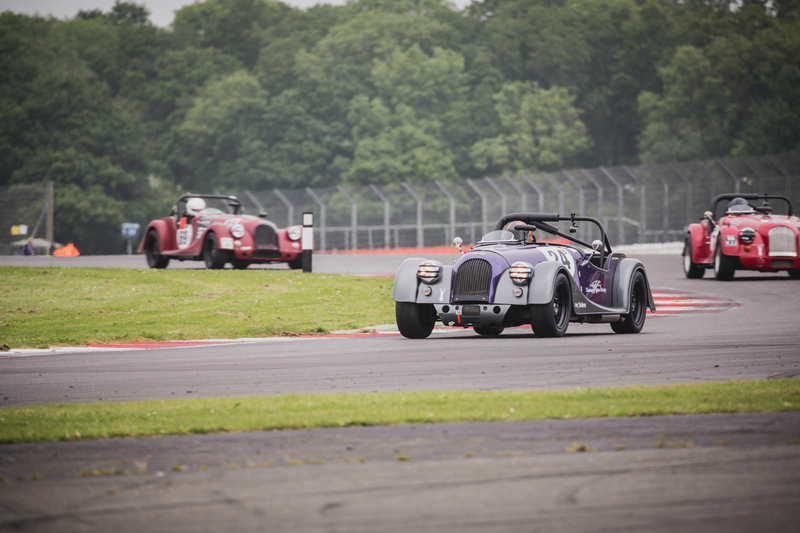 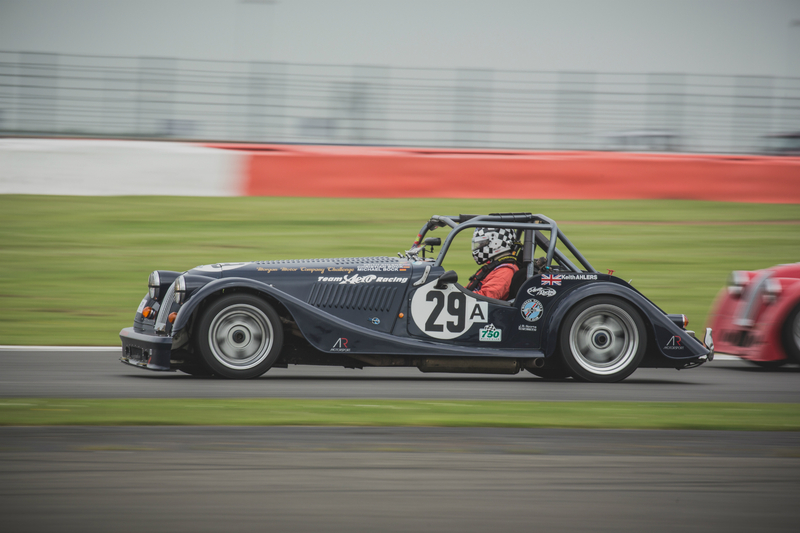 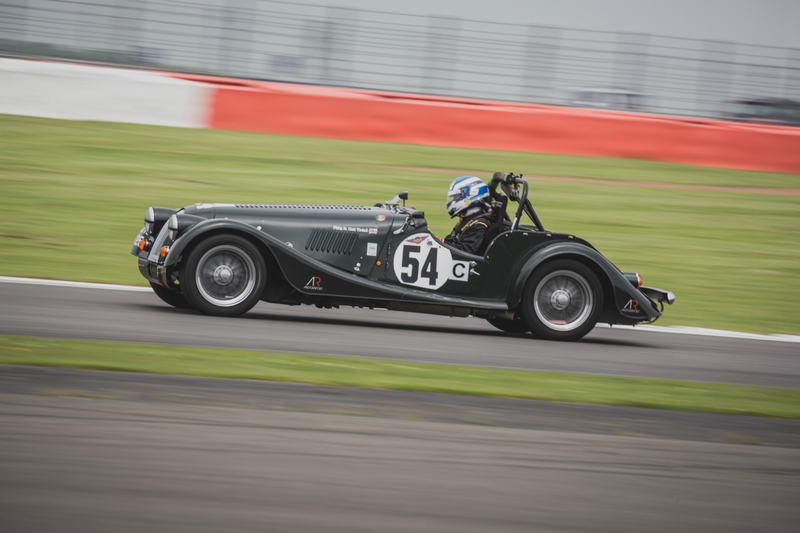 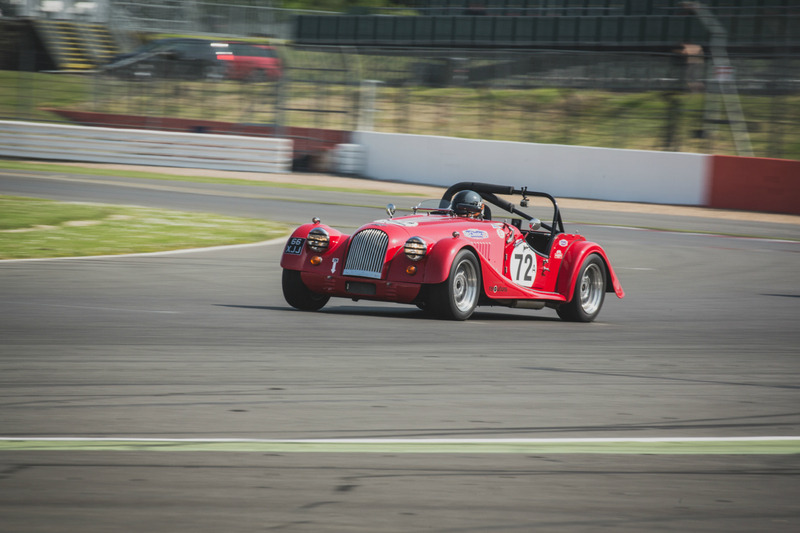 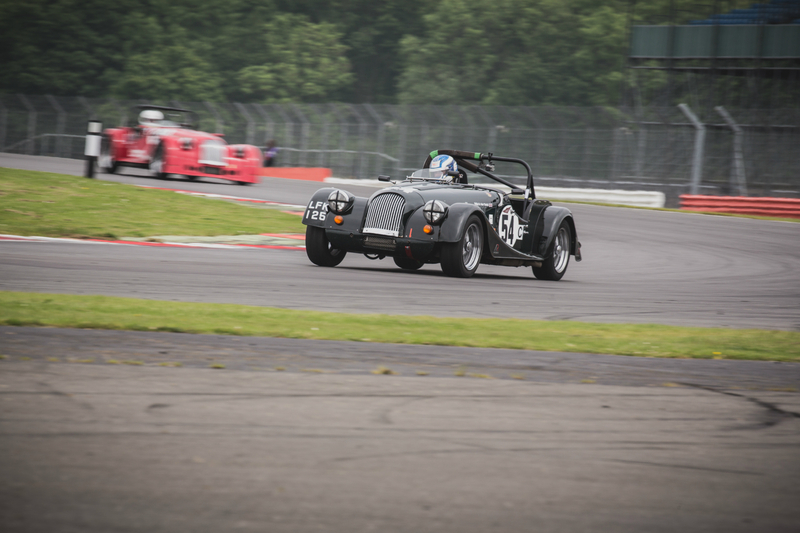 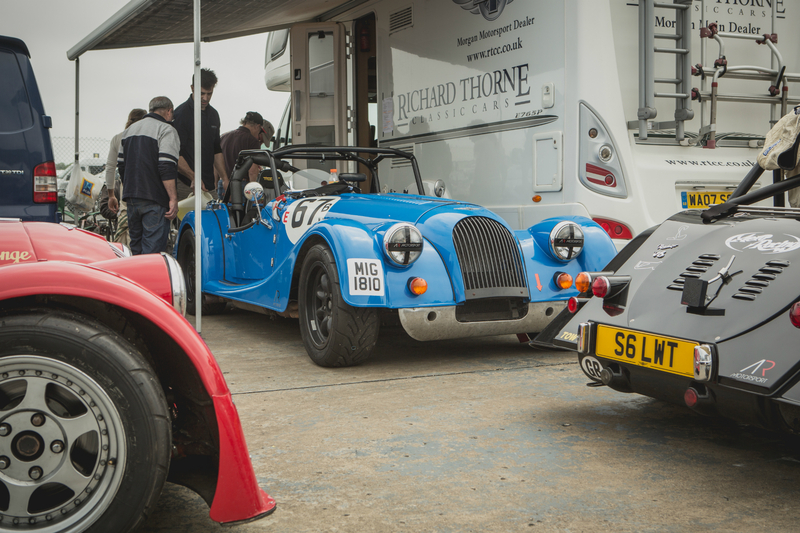 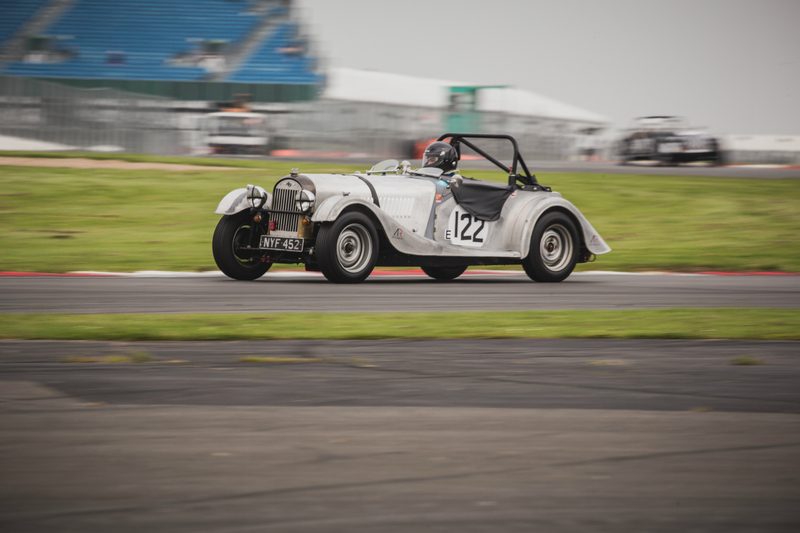 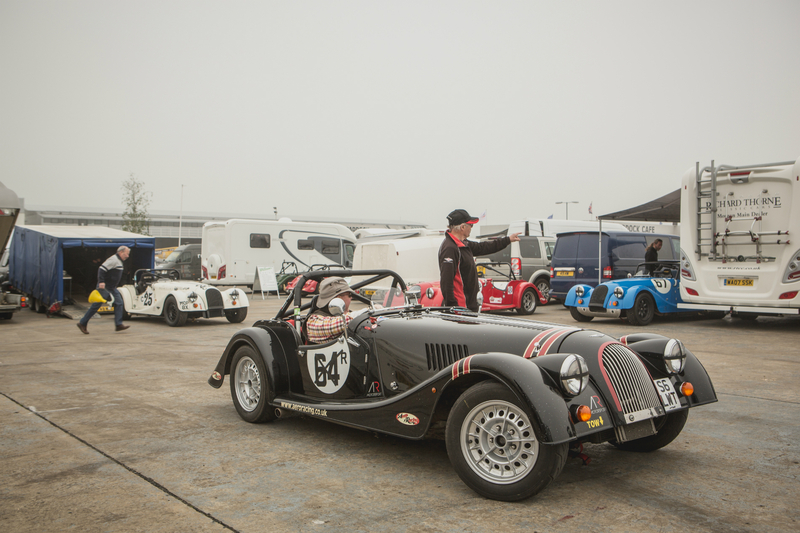 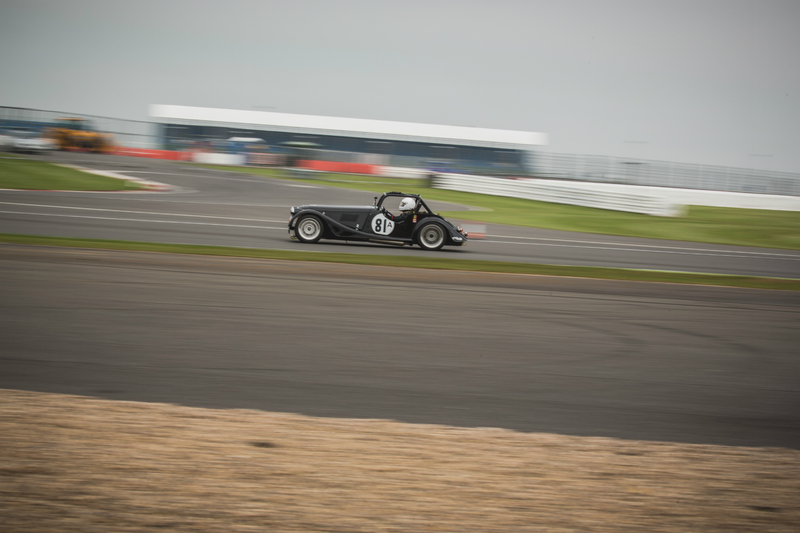 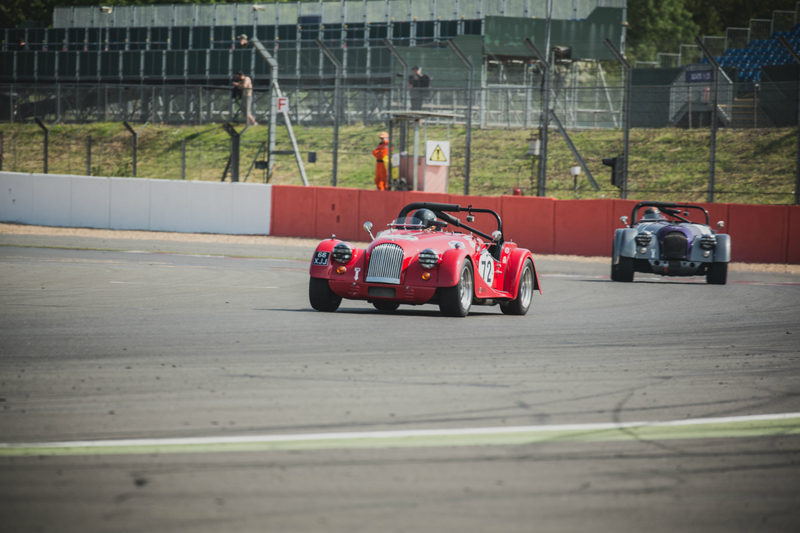 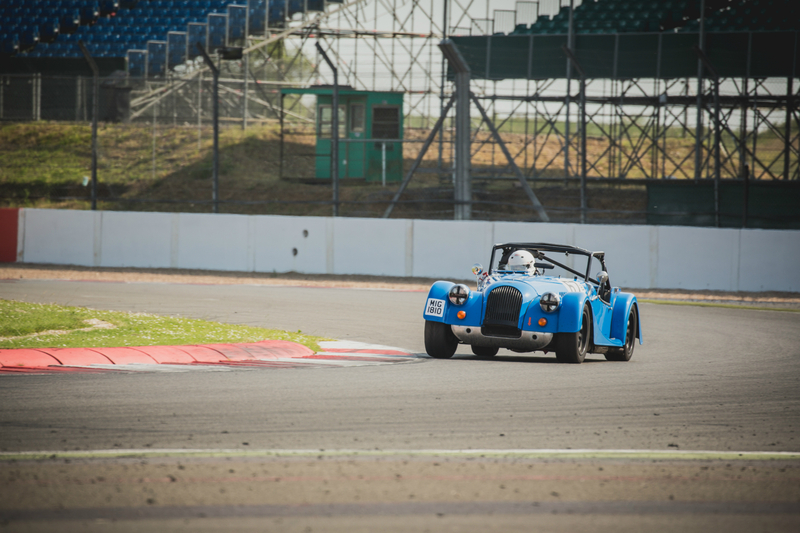 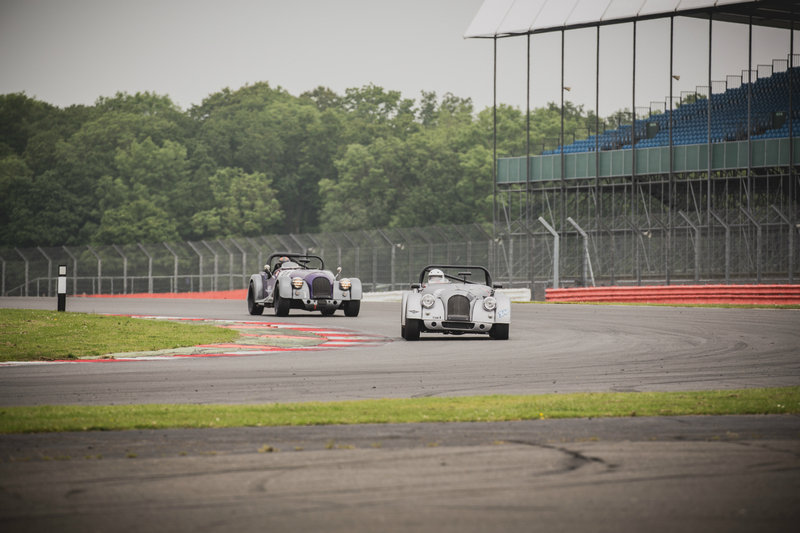 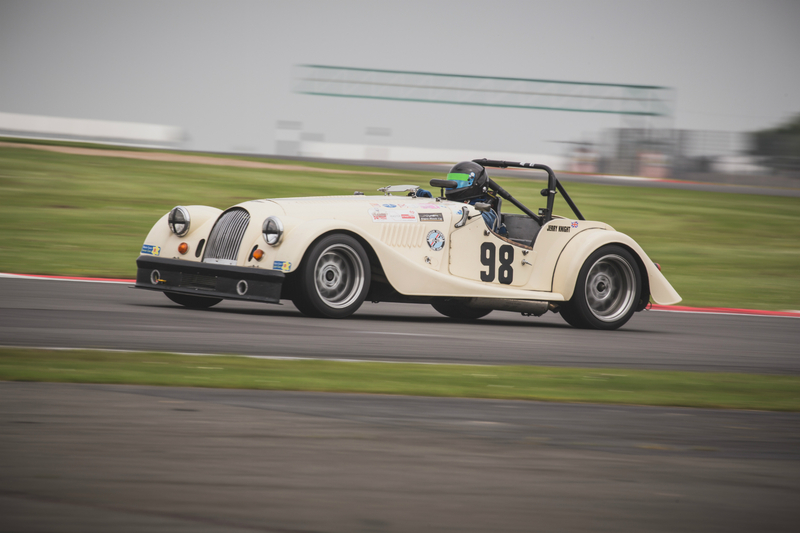 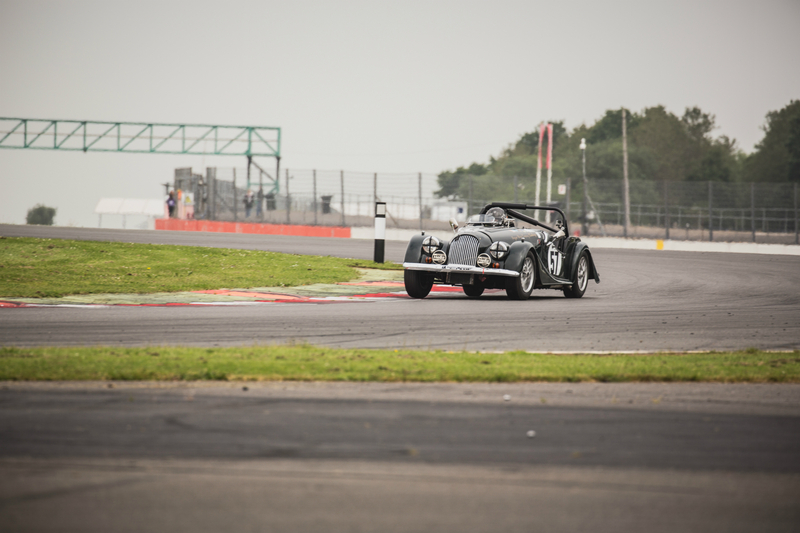 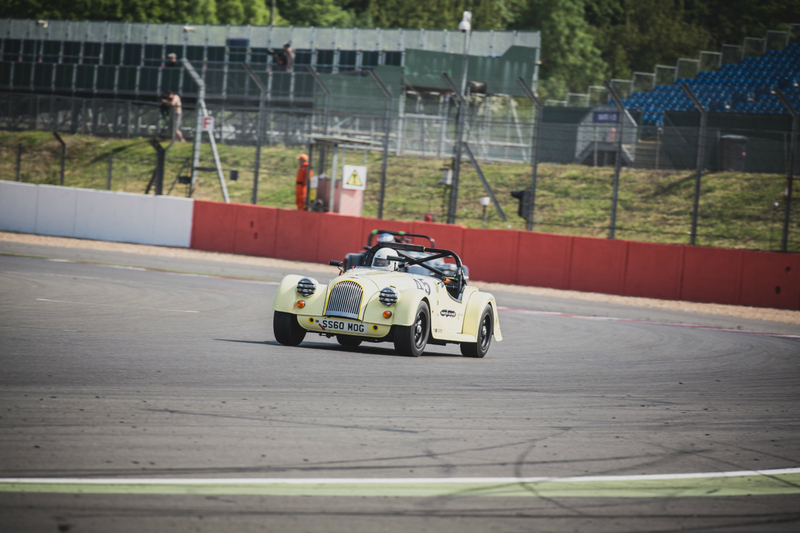 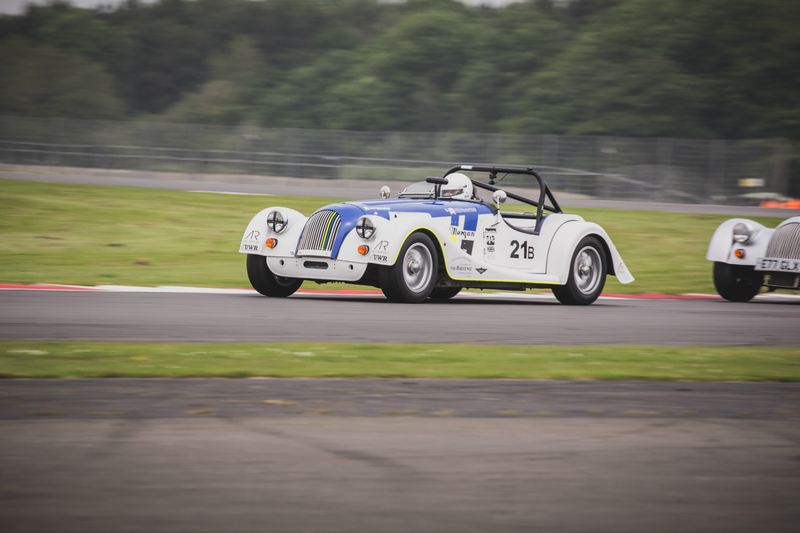 Do you enjoy the Silverstone GP circuit? 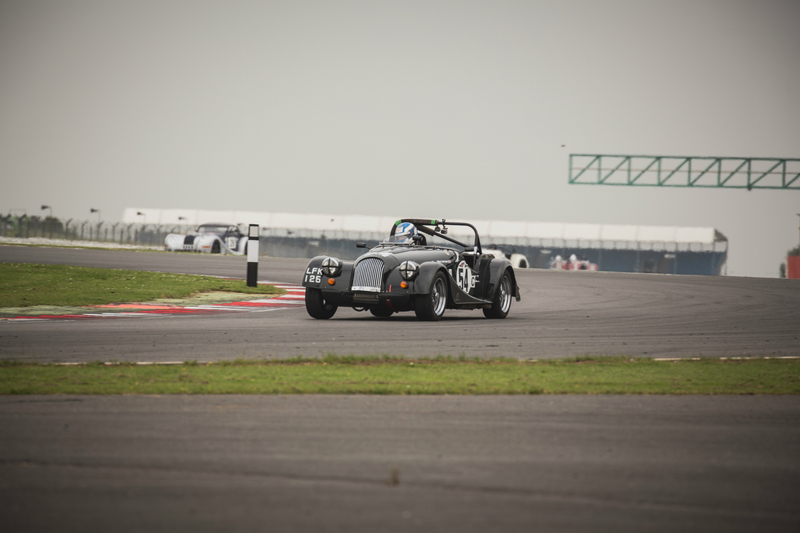 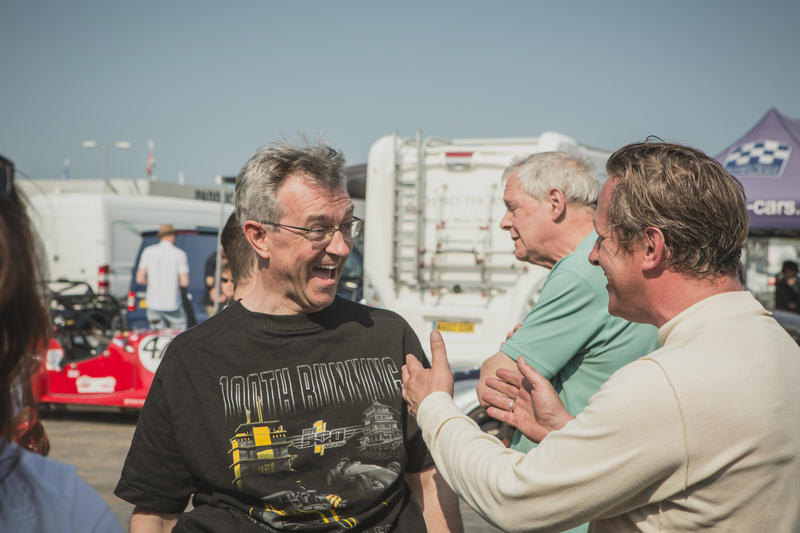 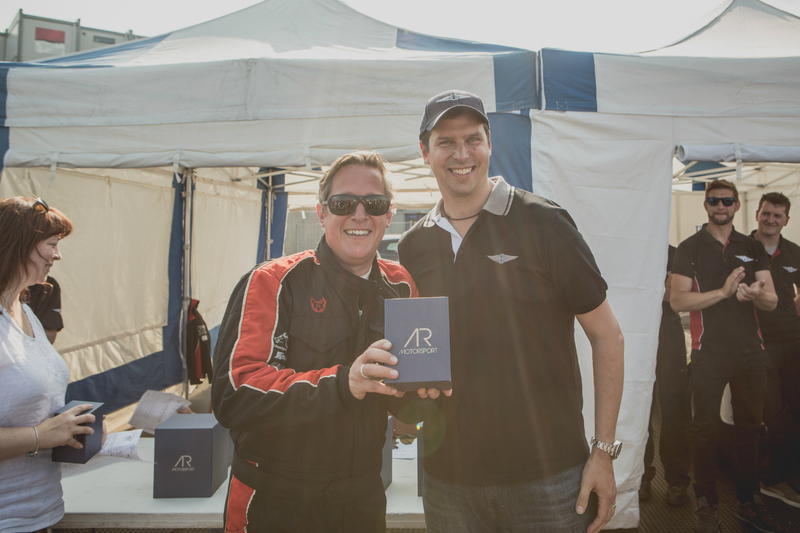 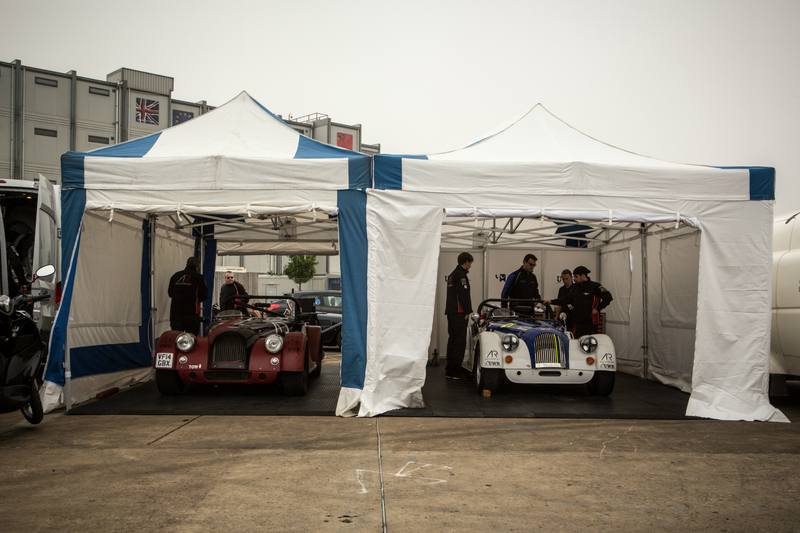 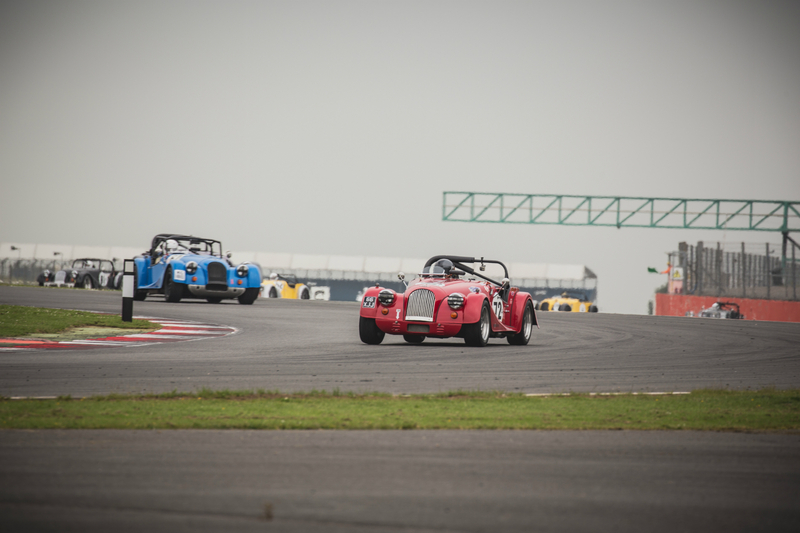 Your expression when you jumped out of the car after the race would suggest you enjoyed it, talk us through it? 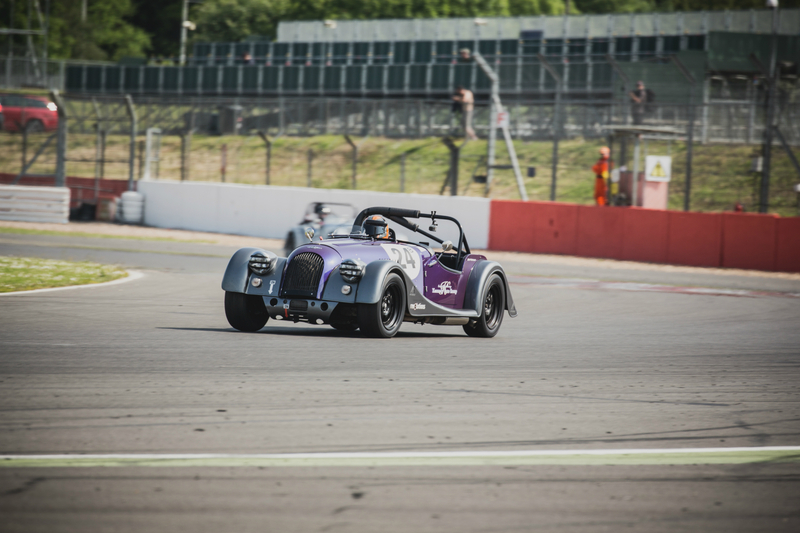 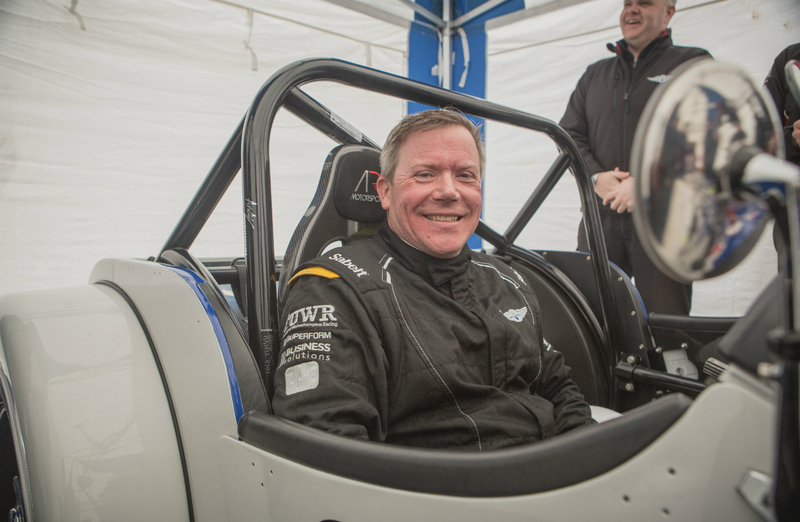 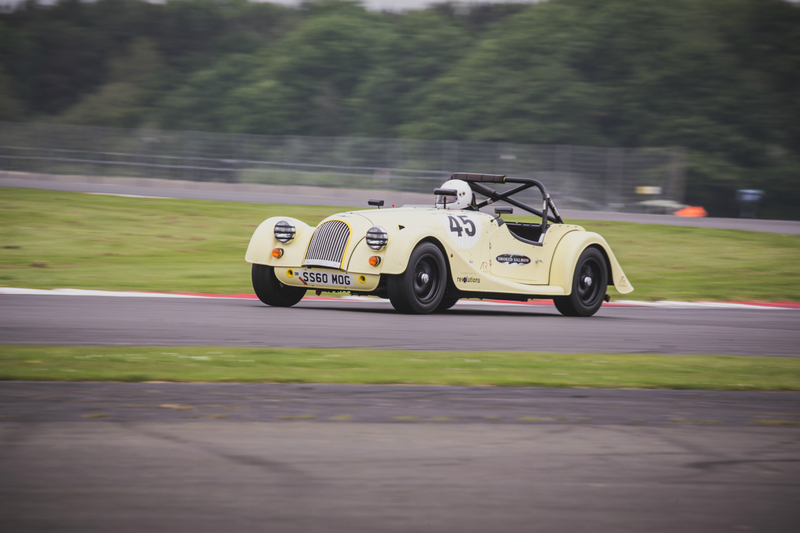 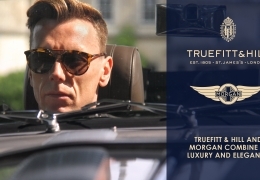 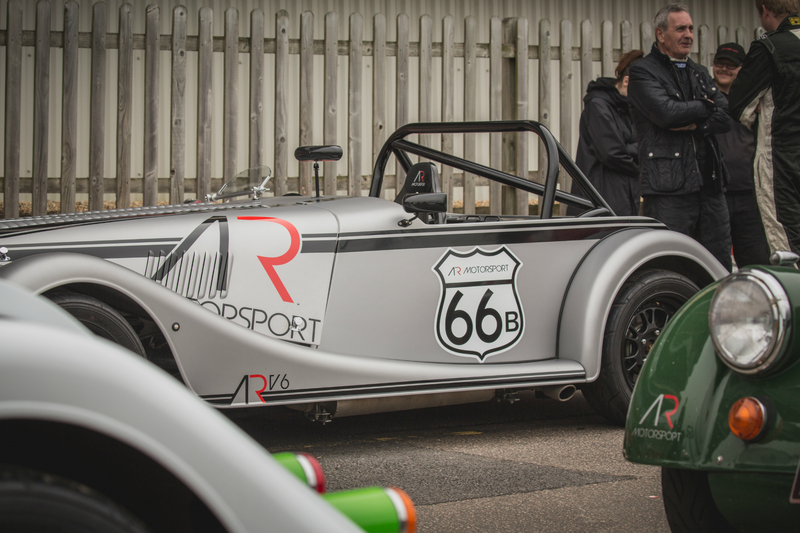 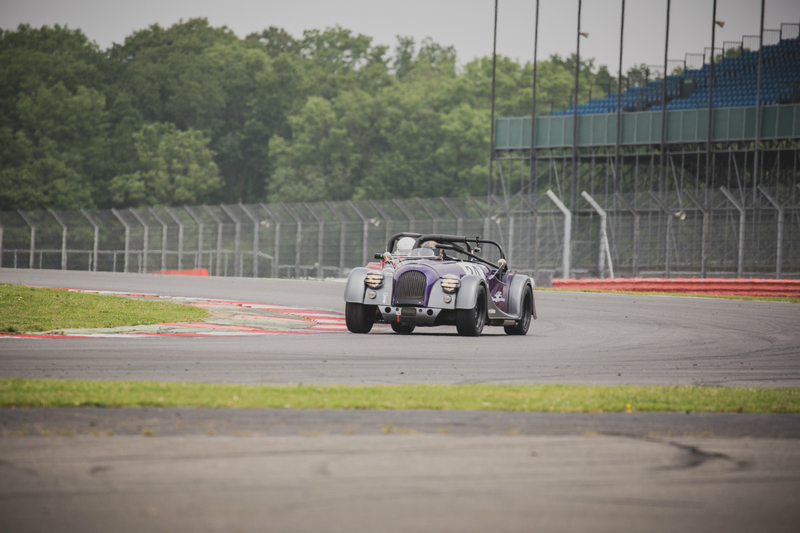 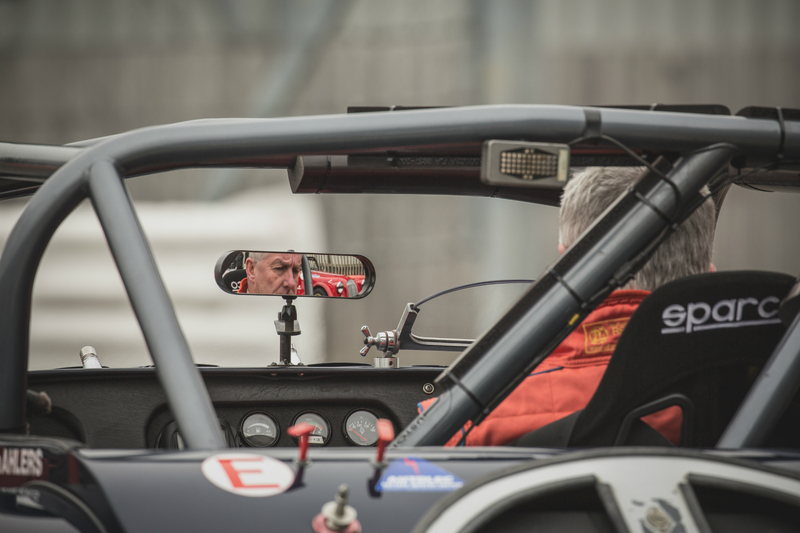 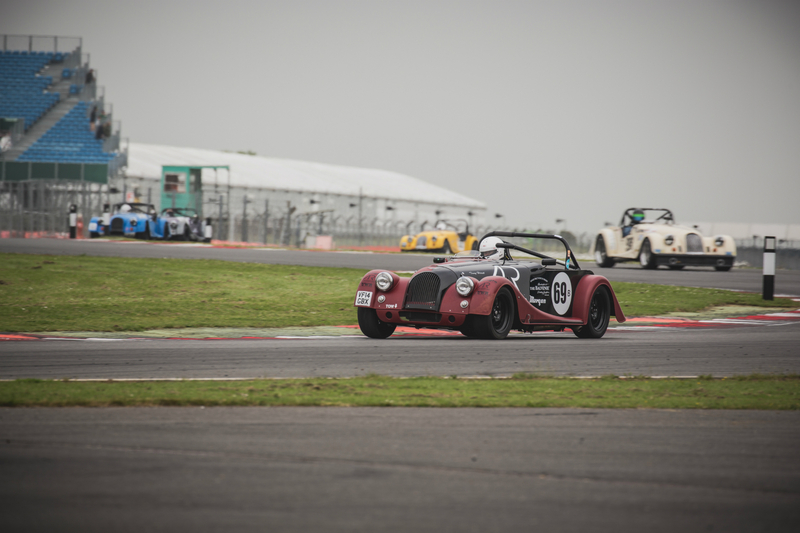 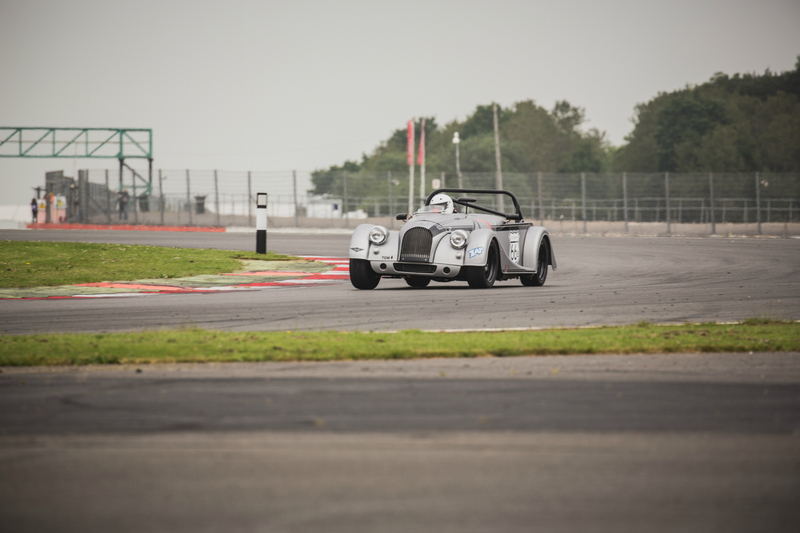 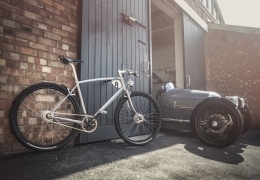 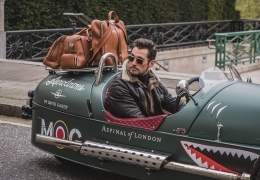 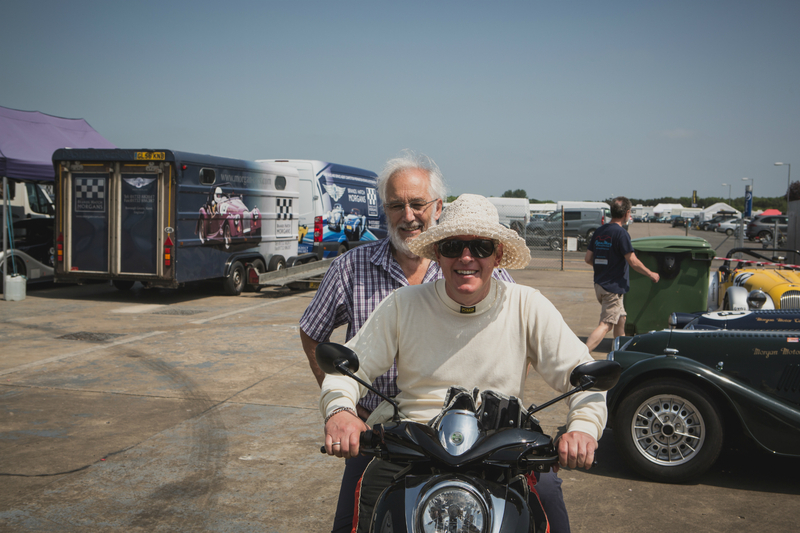 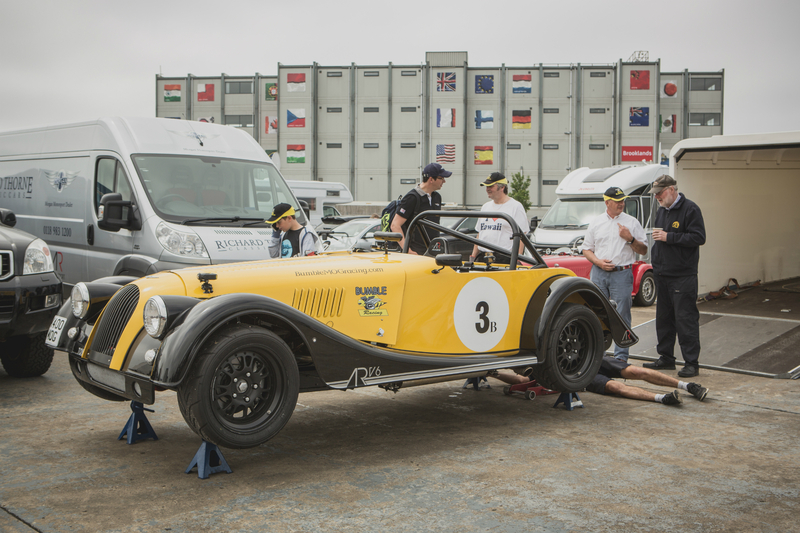 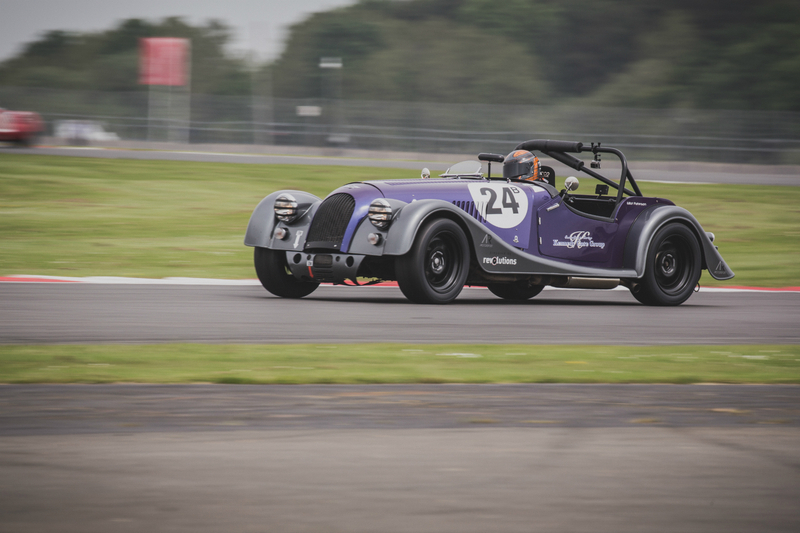 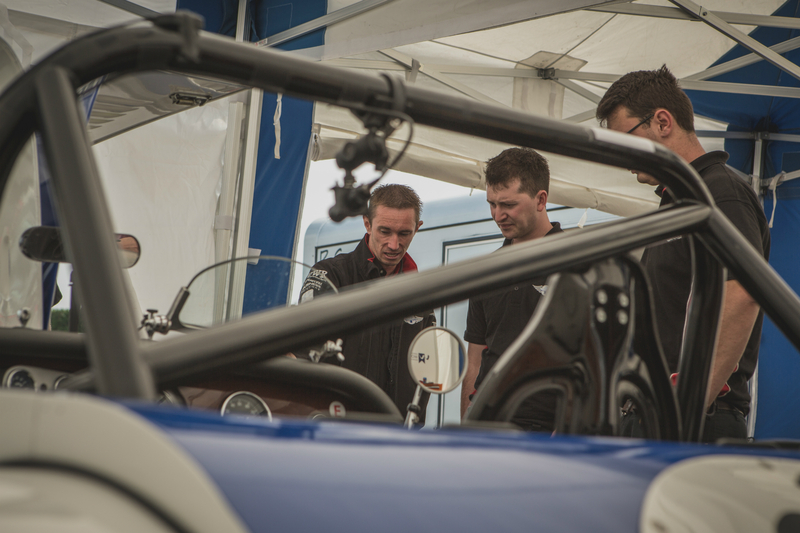 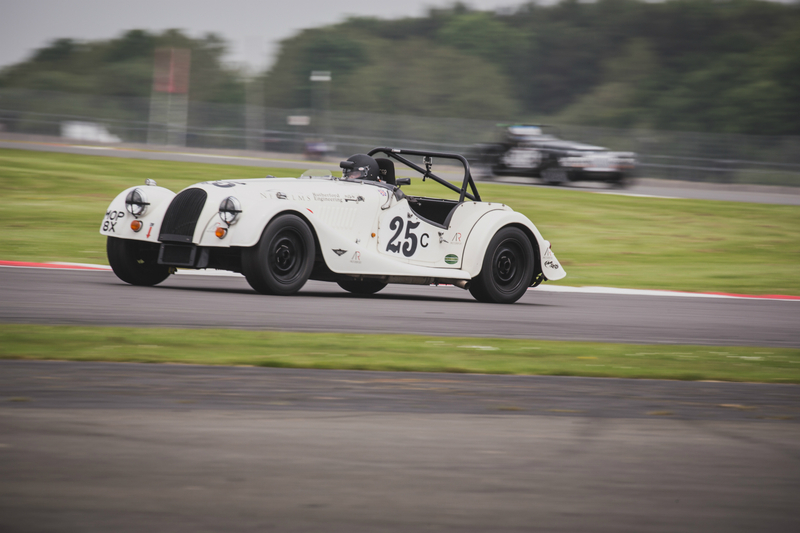 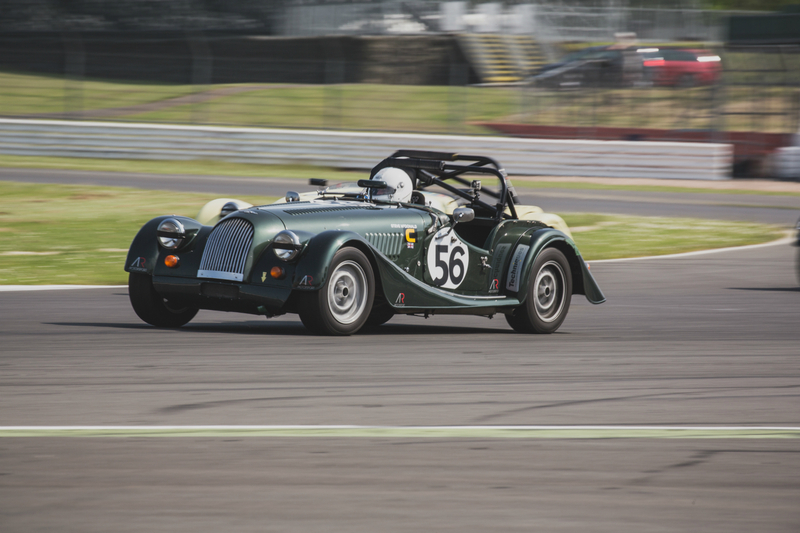 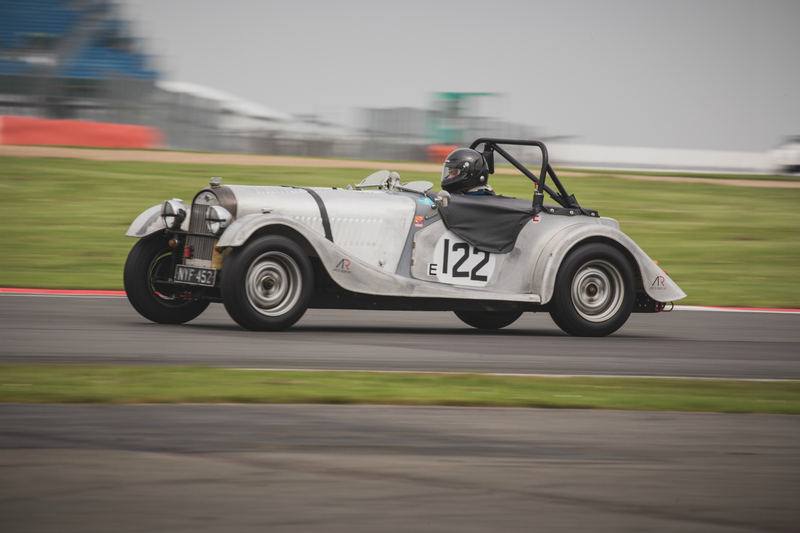 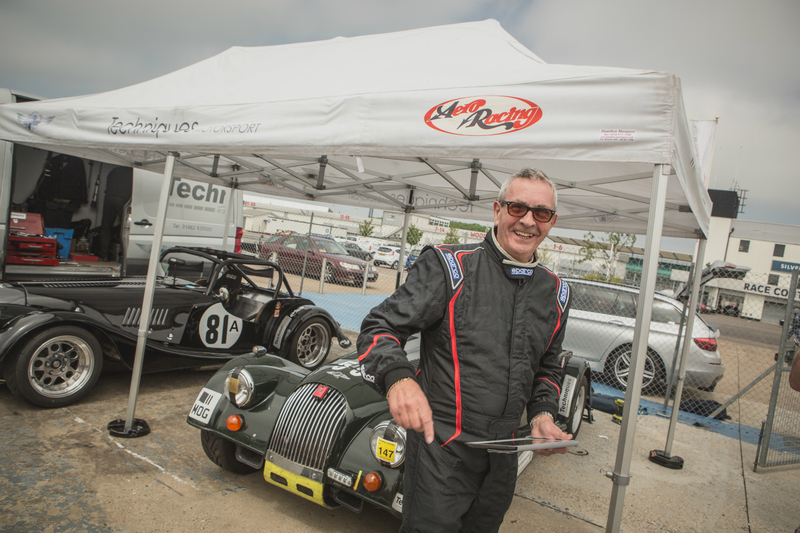 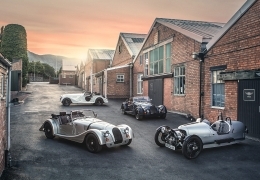 “I think for all the great detail and analysis that you get from a professional driving coach, so much of driving at the limit is about feeling and confidence, especially in a Morgan. 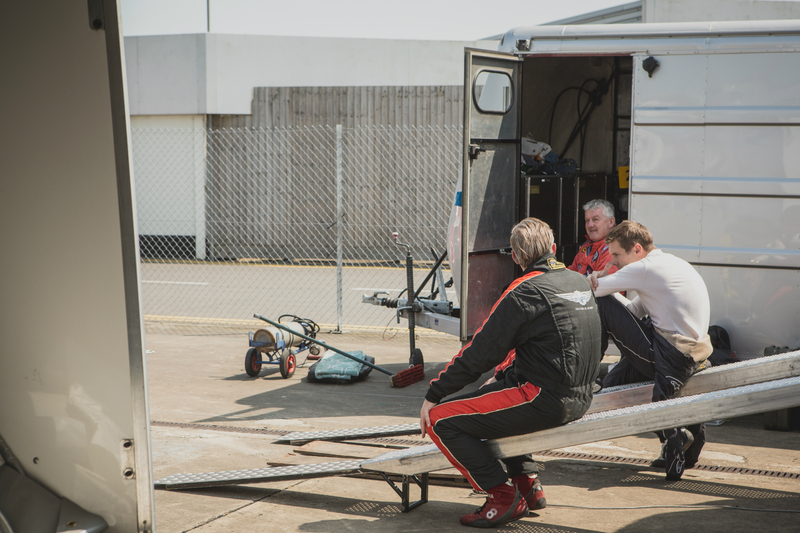 You have to drive the car with its unique characteristics and know what they are, I’ve been feeling more and more confident in the car this season. 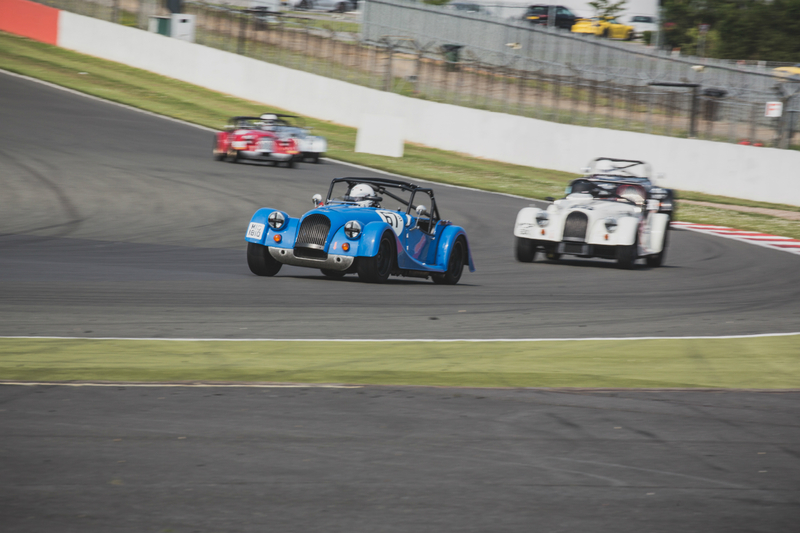 To be able to put that into practise and make no mistakes, catching Andrew Thompson and overtaking him, as well as two very fast class A cars was so exciting. 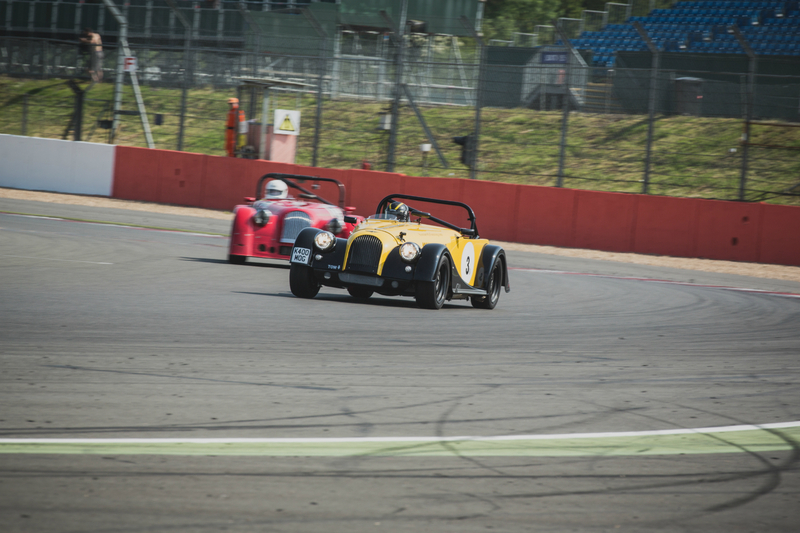 I couldn’t quite get hold of Elliot, but for the race I drove I was very pleased. 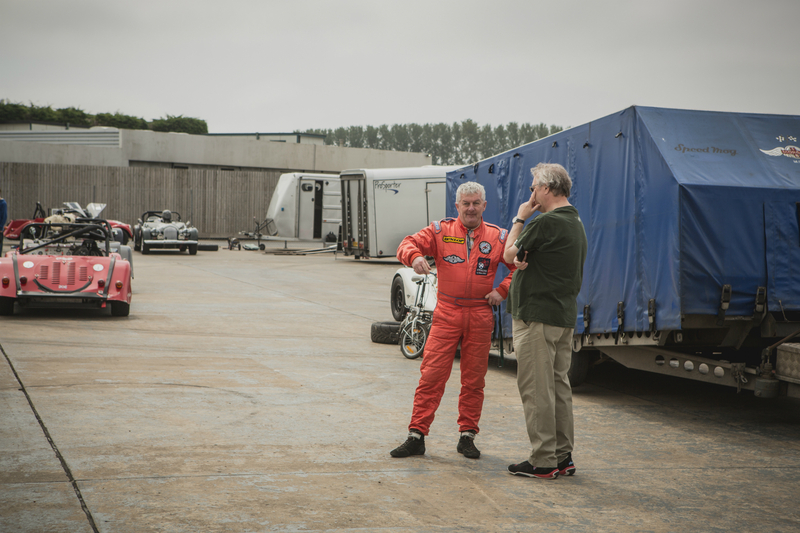 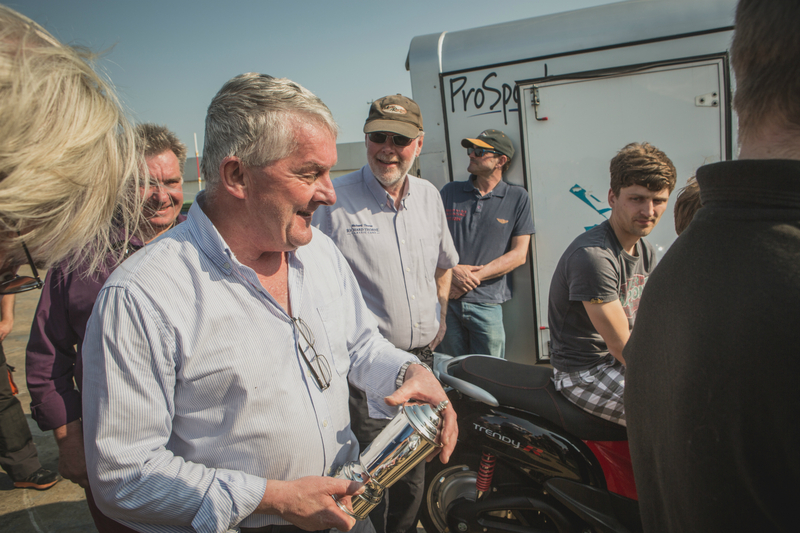 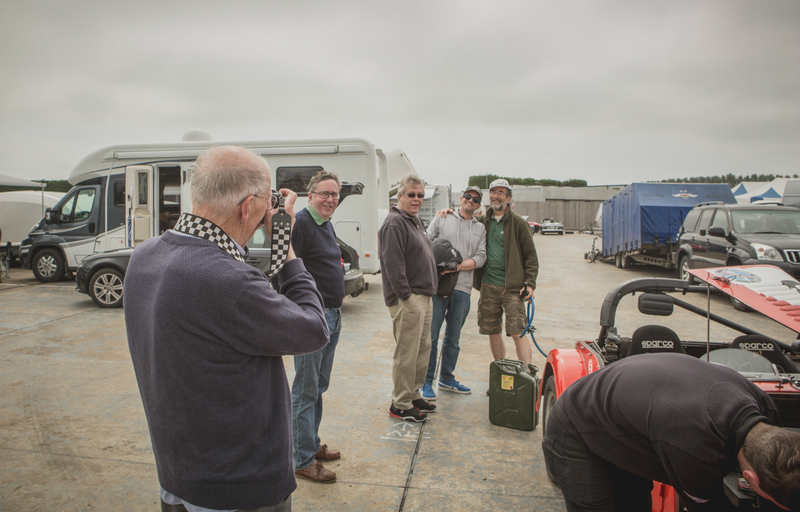 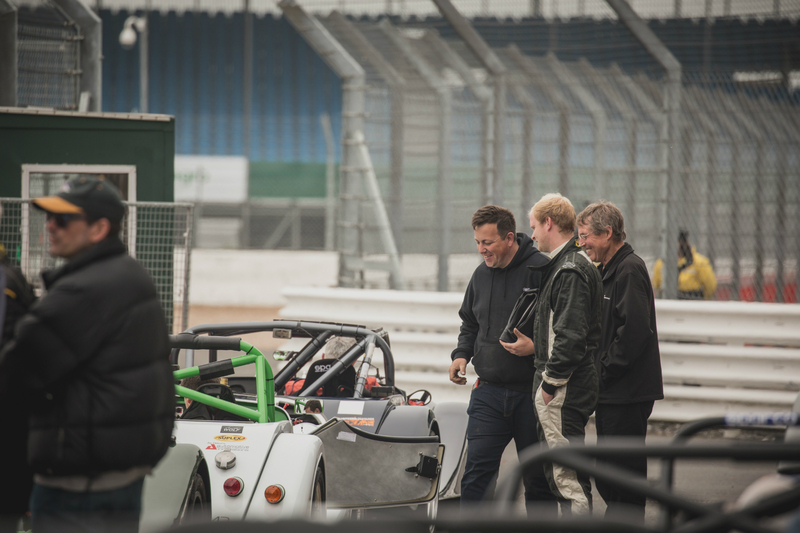 It just epitomises the challenge series that myself, Andrew and Jerry Knight could get such wheel to wheel racing yet still have so much respect, it was hard but fair racing, and yet again proves the essence of the series. 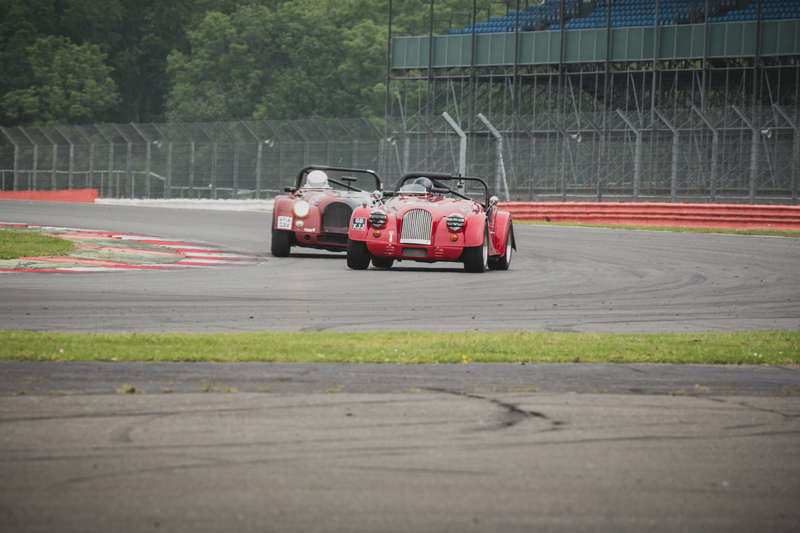 We went through Brooklands and Stowe 3 abreast on more than one occasion, nobody was giving an inch but also nobody was taking liberties.